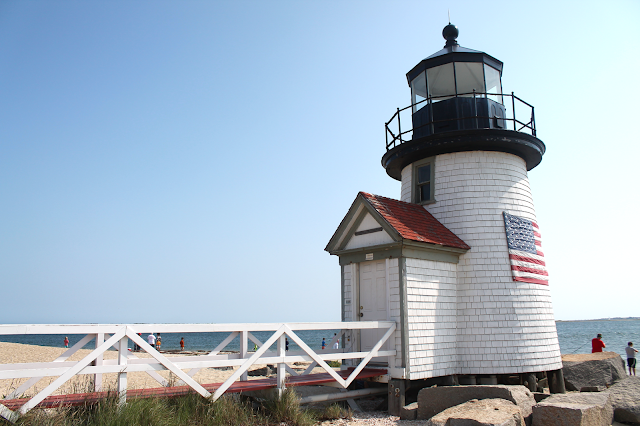 You can catch up with Part 1 (Boston) and Part 2 (Cape Cod), if you'd like. 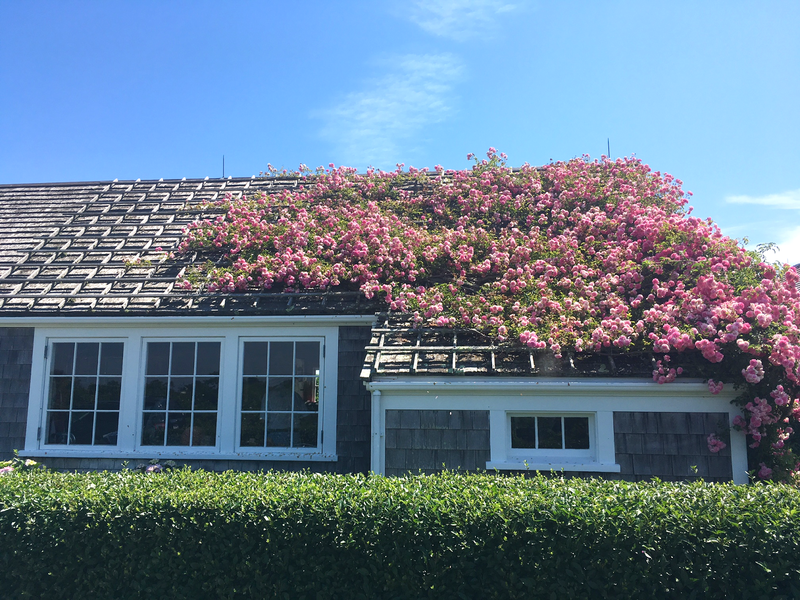 To me, Nantucket is this magical island where only perfect things dwell and everyone is happy. It's like going back in time with the cobblestone streets and old, beautiful buildings. 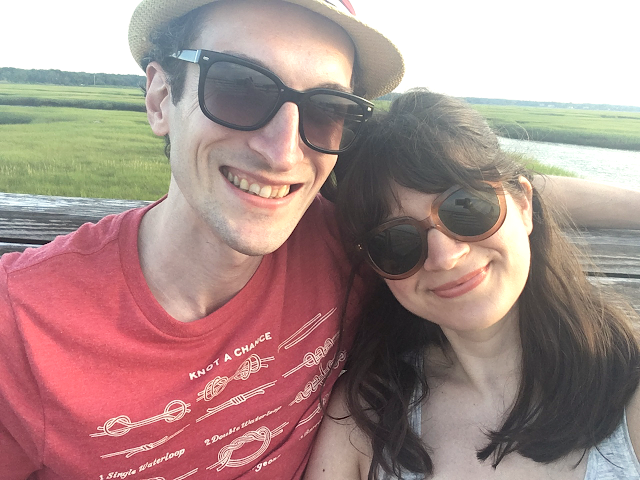 When our ferry docks and I see the gray and white houses and boardwalks, my heart fills with happiness and I'm this smiling idiot the whole time we're on the island. Our first Nantucket sighting as we pull into the harbor on the ferry, and my heart starts to flutter. This year was our third day trip there, and I keep saying that I want to spend at least two to three days next time (maybe off season) to really see the island and take it all in. You can do a lot in a day since it's a small enough island, but at the same time, you do only have a day when visiting from the mainland, so it's hard to see it all. Today, I'm going to talk about my favorite things to do while on Nantucket and our travel tips for getting there. 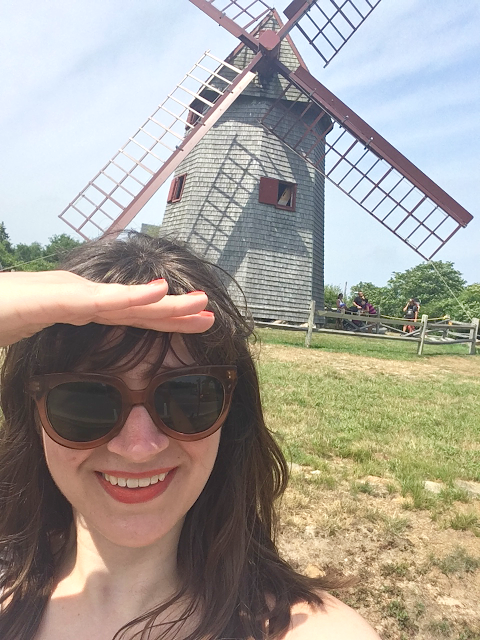 I'm by no means a Nantucket oracle (three day trips does not an expert make). But this may help first-time visitors plan out their trips. 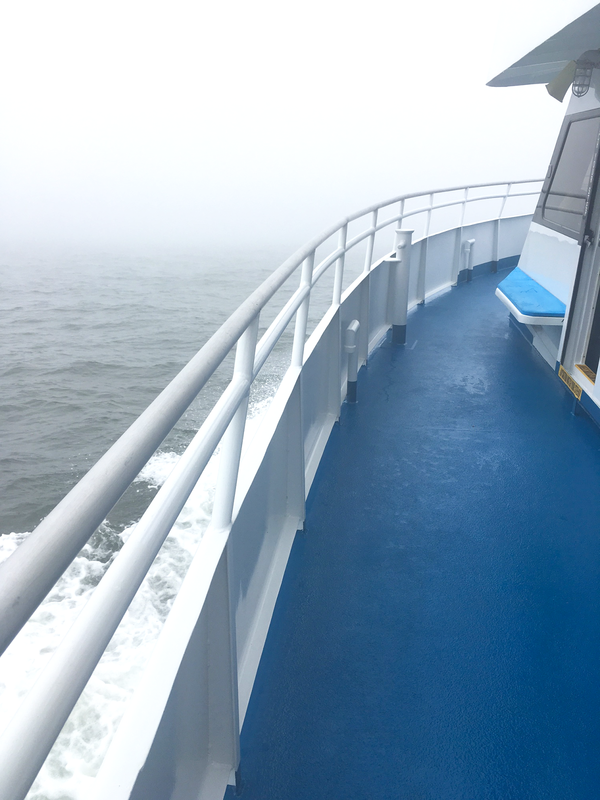 When we departed this year, it was super foggy. But when we arrived, the sunshine was ready to greet us. 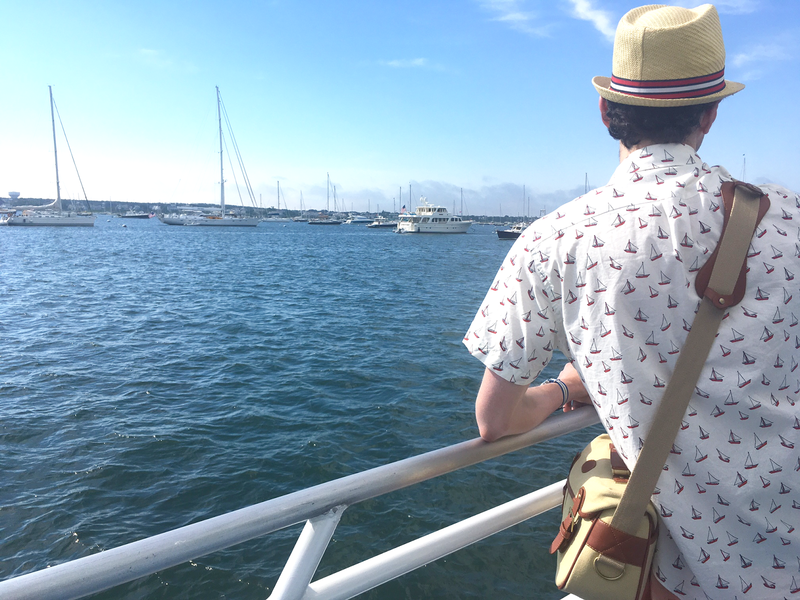 We've taken two different ferries to Nantucket: High Speed Freedom Cruises out of Harwich Port, and Traditional Steamship Authority Cruises out of Hyannis. You can also take a high speed ferry out of Hyannis, we just haven't done that one before. I personally prefer Freedom Cruises out of Harwich Port for three reasons. One, we usually stay closer to Harwich Port anyway, so it's a very short drive to the dock. Hyannis is about a half hour drive from where we usually stay. Two, it's slightly cheaper than Hyannis, only by about $3 or so, but still. Three, parking in Hyannis for the ferries is a little chaotic. Some of the lots require reservations (which they don't tell you when you book your ticket, and we never thought about having to make a parking reservation). So we had to pay about $15 for the day to park, plus worrying about either a reservation, or finding a lot that had available space. Parking for day trips at the Harwich Port ferry is free and super easy since it's a smaller marina. The Harwich Port ferry is a slightly longer trip overall (an extra 10 minutes or so), but it's worth it for us. I think a lot of it depends on where you're staying. If you can spring for the fast ferry prices (which are significantly more than the traditional ferry), and you're staying closer to Harwich Port, do that one. If you need to save a little extra cash, the traditional ferry out of Hyannis is still a good option. 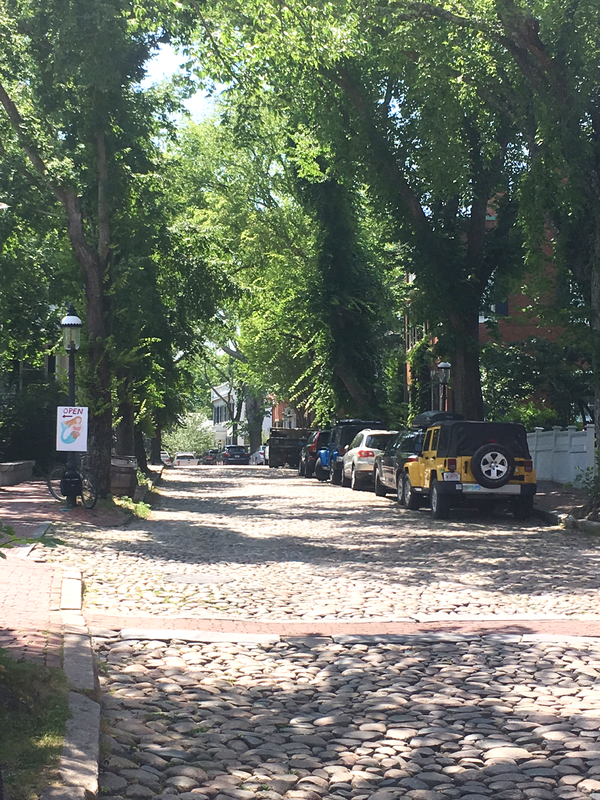 I can't get enough of these cobblestone streets! I'm Here! What To Do? Once you get off the ferry, you're right in town center. Most ferries let you off right around the same area, and there's a public restroom to your left once you de-board, if you need it (I usually do, I have the bladder of a 90-year-old). From there, you can just start to explore town center in all its glory. You're already on the cobblestone streets, surrounded by great boutiques. It's pretty easy to figure out where to go if you're exploring town center - it's all right there. The great thing about town center is that there's so much to look at, and you can shop for days. Shopping will be its own topic below, but seriously, you can walk around town center and look at the hydrangea-lined store fronts and beautiful historical buildings all day. Town Center as you get off the ferry. 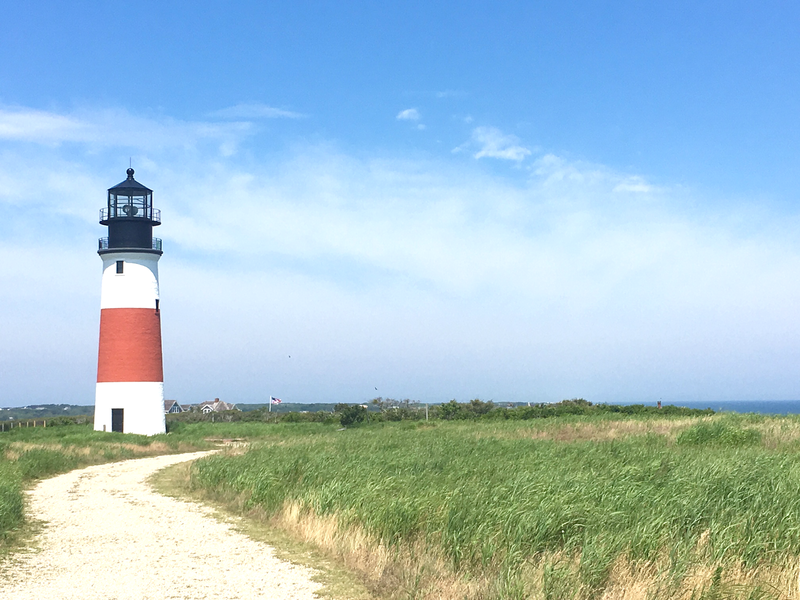 If you want to do a little sightseeing, Brant Point Lighthouse is beautiful, and very walkable from where the ferry drops you off. You'll probably want to pull up a map on your phone, or grab a map from a tourist stop in town, to find it. But it's a pretty easy walk and as long as you turn right after exiting the ferry, and follow the ocean, you'll find it. Once you're there, you'll be in the sand, so take off your shoes, walk around, and watch the boats go by while admiring Brant Point Lighthouse. From our first Nantucket trip in 2014. When you arrive to and depart from the island, Brant Point greets you and bids you farewell. 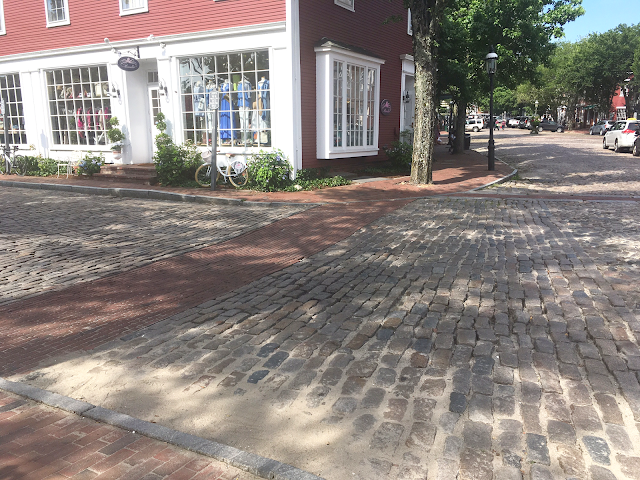 You can also walk to the Old Mill of Nantucket, which dates back to the 1700's. It's just under a mile if you walk to it from town. Our first two day trips to Nantucket, we explored everything by foot, so we really didn't get to see much beyond town center. Our first trip, we walked up and down Cliff Road to see some of the beautiful houses, but it's a bit of an incline, so it's not the most relaxing stroll. This year, we rented a moped for the day, and it was one of the best decisions of our vacation history. 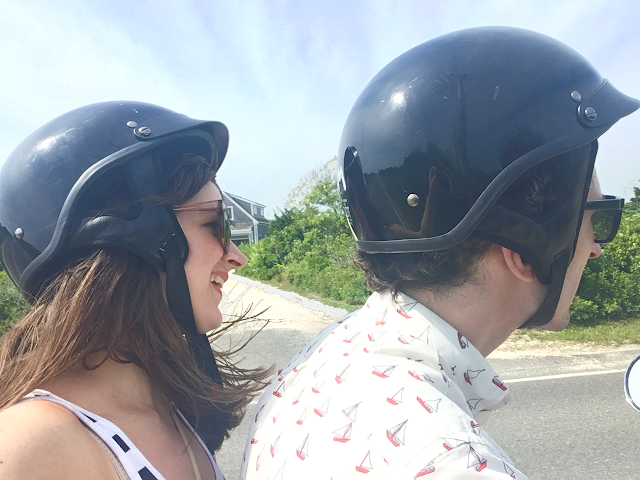 Having the moped allowed us to see so much more if the island. 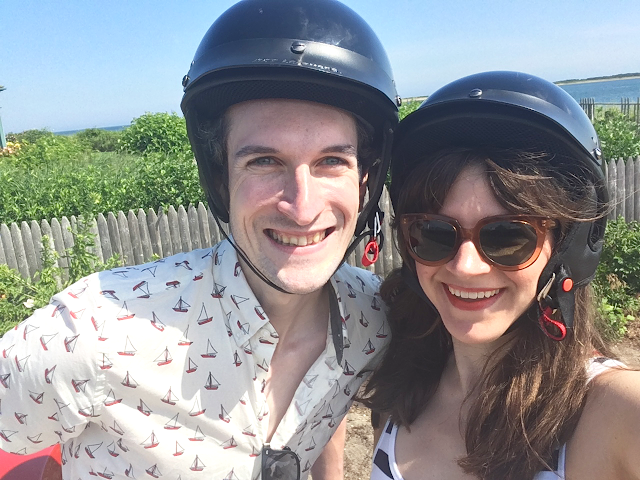 We were able to ride up to Siasconset to explore the Bluff Walk and Sankaty Lighthouse. 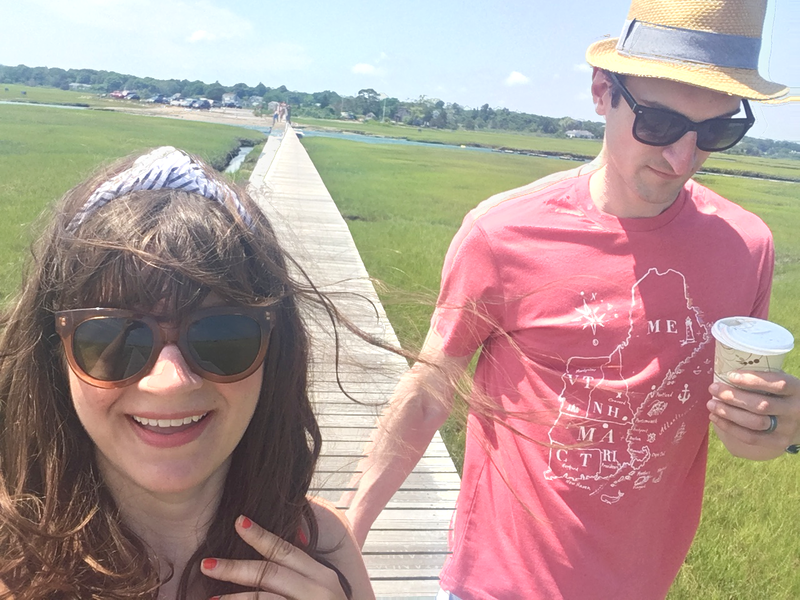 We could have explored more if we hadn't wanted to stop in town for some shopping and lunch before our ferry departed, so this is definitely the way to go to see as much as possible in a short amount of time if you're doing a day trip. 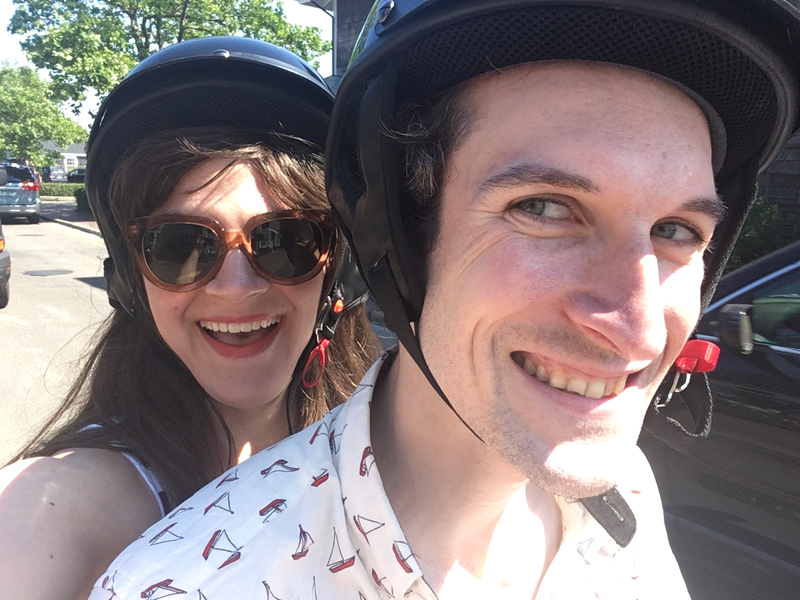 We did look into renting bicycles as well, which are obviously a little less expensive (the moped was $115 for the day, but included unlimited mileage and gas, plus two helmets, which were very, very clean). I know some people who have biked around Nantucket, and they love it. After mopeding around and seeing the bike trails, I'd recommend this option as well if you feel like a bit more of a workout. The bike paths from town center to 'Sconset were amazing and very easy to navigate. We were surprised by their accessibility, actually. It was a pretty straight shot alongside the main road, but very safe and protected. It's really personal preference on what you'd like to do, and how much time you have. Let me just say, I'm so happy we finally made the trek out to 'Sconset. 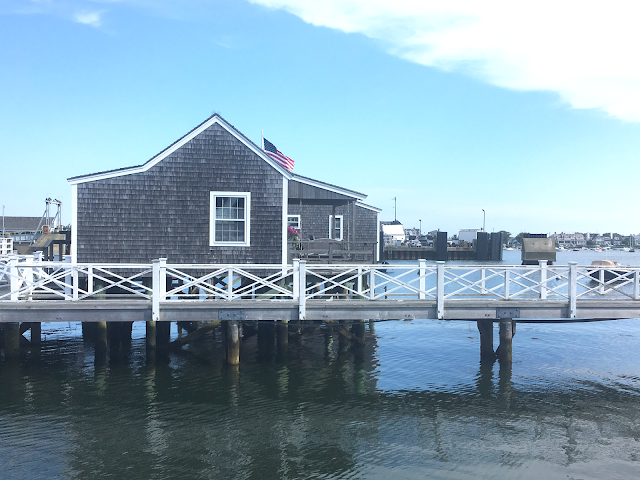 It's a pretty small little town, but so beautiful and very Nantucket (there's no other way to describe it). 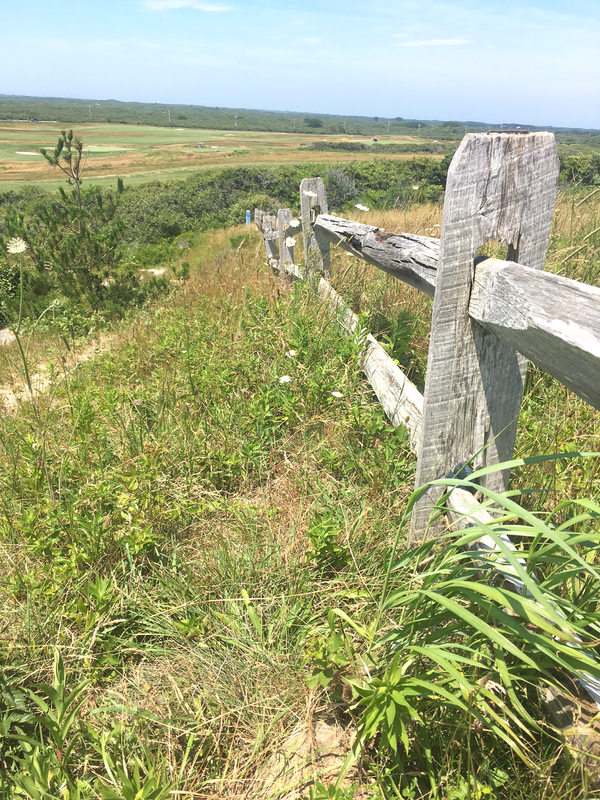 We read online about a bluff walk that you can do there which overlooks the ocean while you also get to pretty much walk through the back yards of some multi-million dollar homes, so I was totally on board with this. It's a little hard to find, but I used this guide and had no issues finding our way. I was surprised at how literal the "you'll be walking through peoples' back yards" direction was, because you totally are. But it was so cool to see all these gorgeous, huge homes right on the ocean. 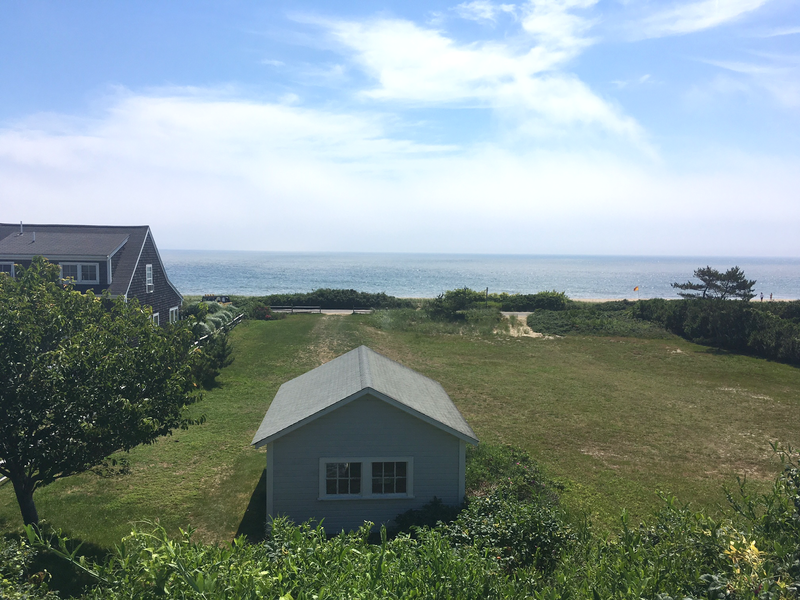 Plus, you'll see stunning views of the ocean as you walk. It was worth doing. Once you're done, you're greeted by a sign that tells you it's the end of the Bluff Walk, and to exit to the street, and you just walk back to wherever it is that you started. The Bluff Walk is pretty narrow, so I think they do this to keep everyone walking in the same direction, but I could totally be making that up. 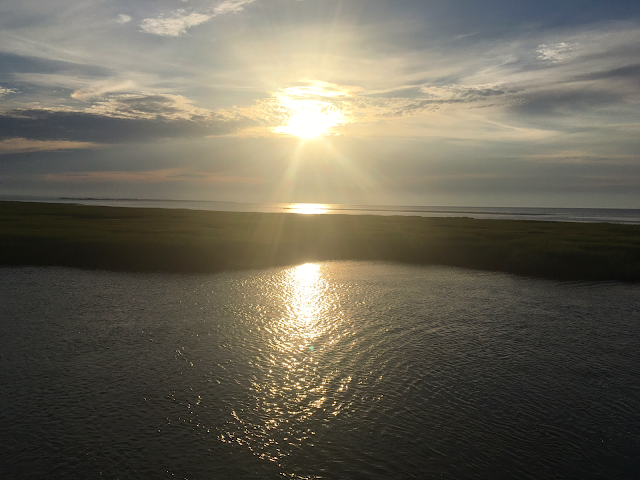 View from a bridge in 'Sconset. 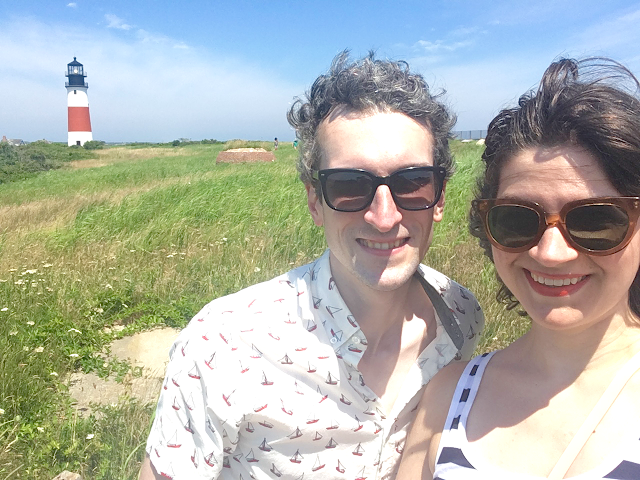 We also rode up to Sankaty Lighthouse, since I have a thing for lighthouses. It totally felt like I was in Anne of Green Gables or something. Beautiful long blades of grass swaying with the wind, and the sun filled the entire area with perfect golden light. It was just spectacular. 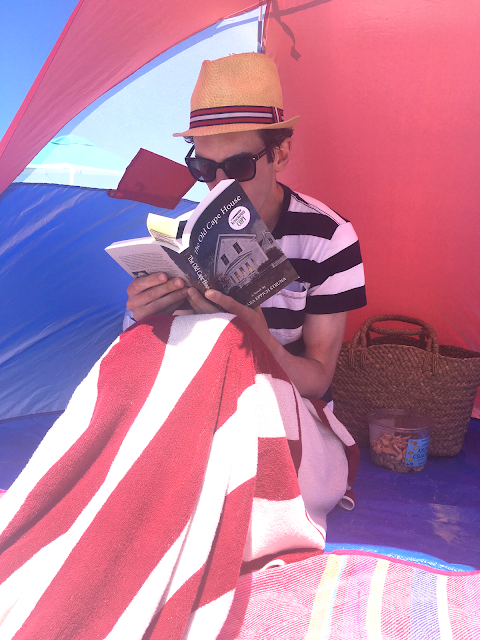 It helped that we had the best weather, so everyone's experience there may not be as magical, but ours totally was. A house on the street leading up to Sankaty Lighthouse. They were all literally perfect. The 'Sconset town center is very, very small. There's pretty much a little market and a traffic rotary, and not much else - except for the beautiful homes and scenery (no big deal). The market made me laugh because they apparently sell fancy groceries, in case the regular groceries you bring aren't good enough for you. 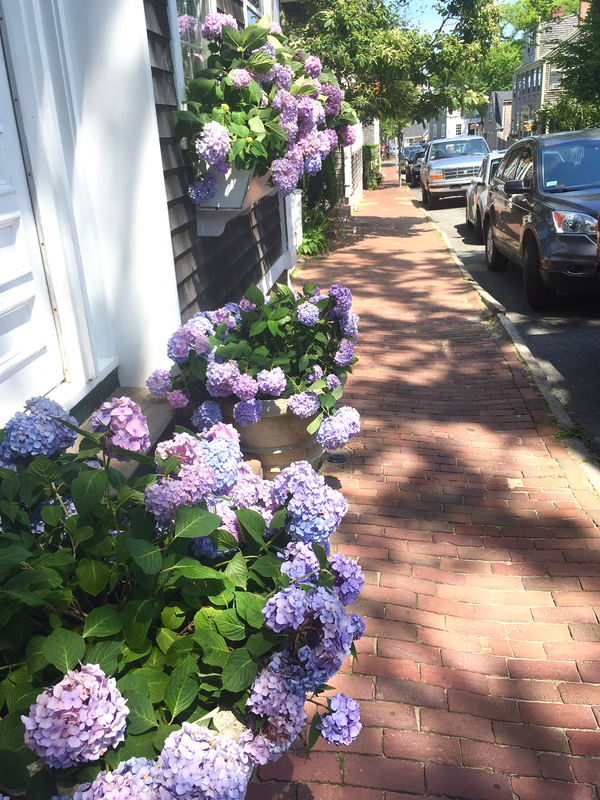 I'm not going to lie to you, one of the main reasons I love coming to Nantucket is the shopping. Seriously, it's amazing. Yeah, they have some pretty touristy shops, but most of the stores are beautiful with unique things, and I could spend hours hitting up the boutiques. There are so many stores in town center, beginning right as you get off the ferry, further into town, and up and down the cobblestone streets. If shopping is something you're interested in, I would budget at least 2-3 hours to explore most of the stores. One of my favorite stores is Blue Beetle. This year, I actually bought a gold Nantucket-shaped necklace (so, you know, I can declare my love for the island to everyone that sees it). I also got this beautiful turquoise ring there this year that makes my heart flutter. But they have beautiful everything there. The jewelry is what I go to look at, but they have other accessories and clothing items, too. There's a great store in town center called the Nantucket Perfume Company. I've talked about this place to a lot of people I know because it's just an amazing concept. For someone like me, who's incredibly sensitive to smells, most of all perfumes, it's the best place you'll ever find. This little storefront uses natural essential oils to duplicate popular perfumes. They only use the oils, however, whereas most perfumes on the market dilute their synthetic fragrances with alcohol, which diminishes the wear time on your skin. These perfumes, because they're oil based, last on your skin all day with the smallest little dab. I can still smell it after I shower - it's just amazing. I've gotten two Jo Malone fragrances that they've replicated here, and they don't give me the headaches that regular perfumes give me. They also have their own blends, and there's one called Nantucket Holiday that I love (but haven't gotten yet). It's totally worth checking out if you're visiting the island. 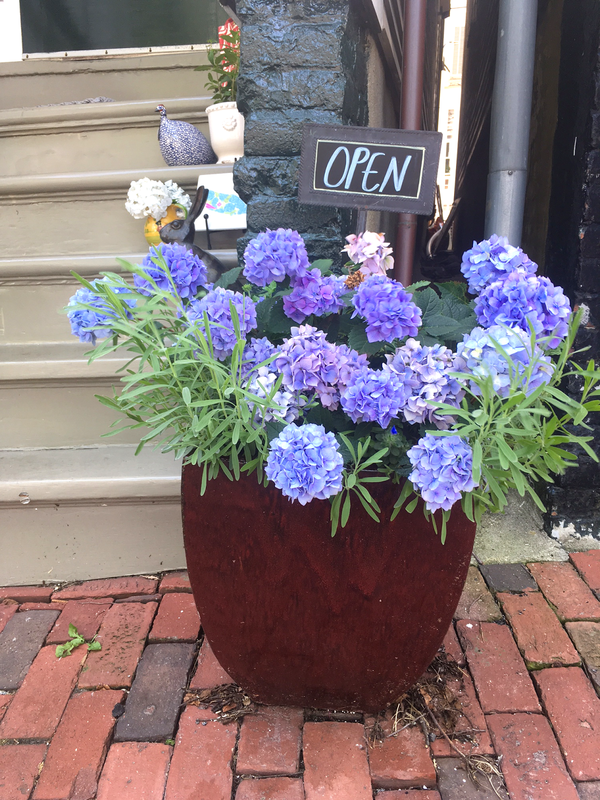 One of my favorite Boston-based natural beauty boutiques, Follain, also has a store on Nantucket, so even though I hit it up in Boston, I still go to this one because I love it that much. There are so many other stores I love going into - you really just need to walk the streets and pop into each and every one to see them for yourself. A couple others I can think of off the top of my head are The Lion's Paw and Nantucket Looms (both housewares stores). To be honest, I'm not much help in this department. 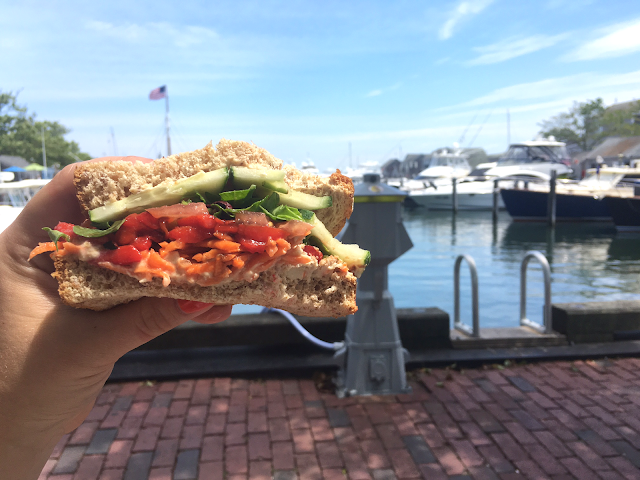 Since we're only ever there for a day, and our ferry departs right around dinnertime, we only ever have lunch on Nantucket. The past two years, we ate at Something Natural, which is an amazing sandwich/bakery cafe. They have a lovely picnic table area outside to sit at, overlooking a very peaceful park area. The sandwiches are literally as big as your heard. No joke. I very highly recommend it here. 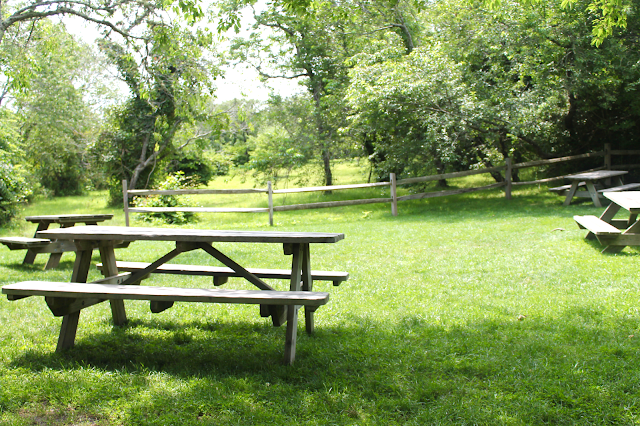 The picnic tables at Something Natural. This year, we ate at a cafe closer to town center called Fresh. The sandwich we got was really good, but I didn't think it was quite as good as Something Natural. You can't go wrong with either, but Fresh doesn't have much going for it as far as scenery (you order inside at a very non-exciting counter, and there's no place to sit down), so I would recommend Something Natural if you're looking for a good sandwich because it's more of an experience, and I liked their food a little better. The Tree Hugger sandwich from Fresh. We enjoyed it on a bench overlooking the harbor in town. For ice cream, we always go to The Juice Bar. I've heard it's the best, so we always stick with it because it lives up to the high expectation. They make their own waffle cones, so I'd recommend getting one of those. This past year I got the Strawberry ice cream with chocolate sprinkles in a waffle cone, and it was amazing. And really, that's all I've got for food recommendations. 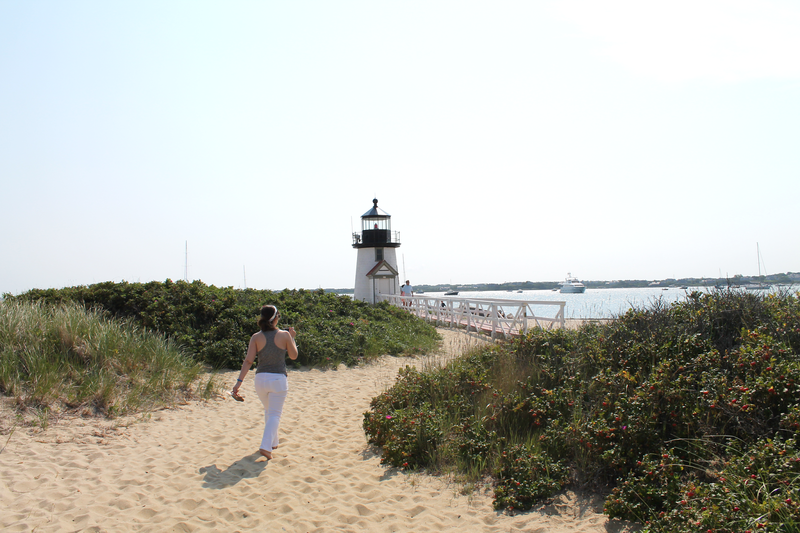 We've taken a day trip to Martha's Vineyard, too, and we loved it there as well. But, that island is so much bigger and it was harder to see in a day because we had a lot more traveling to do to get from town to town. 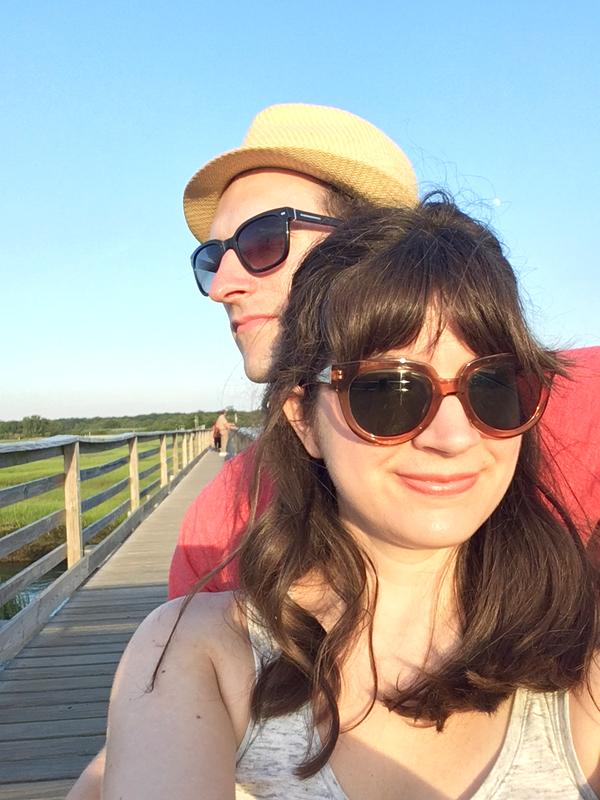 So this year, for our anniversary in September, we booked three nights on Martha's Vineyard to really get a feel for it. I'm so excited - I've always wanted to visit Aquinnah to see the bluffs, and also experience the Cape during off season. 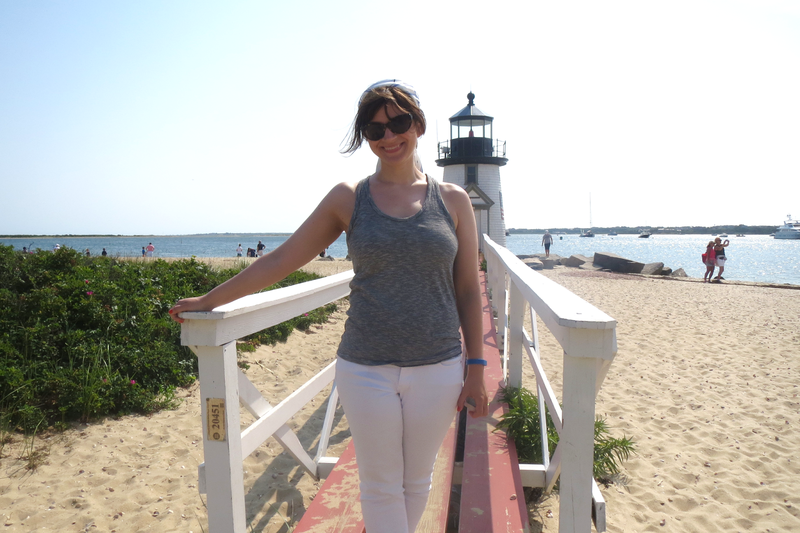 I'm now officially counting down the days until the ocean and I meet again, and being able to really see the Vineyard. 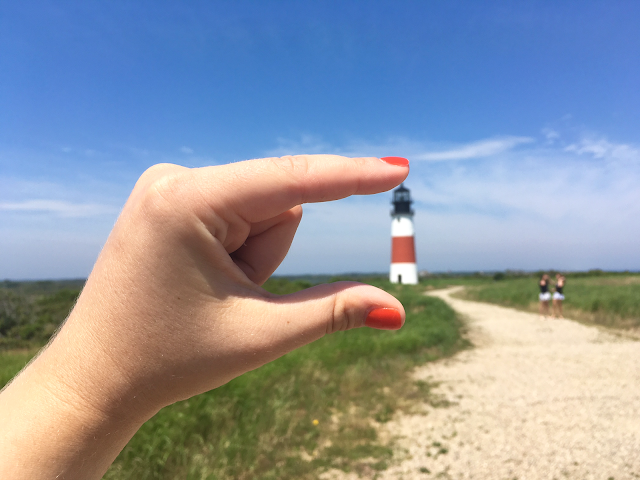 Because I love Nantucket so much, I really want to do the same kind of trip there, too. I'd love to stay somewhere on Nantucket for 2-3 nights to really get a feel for it and take in the whole island. It's on the bucket list! 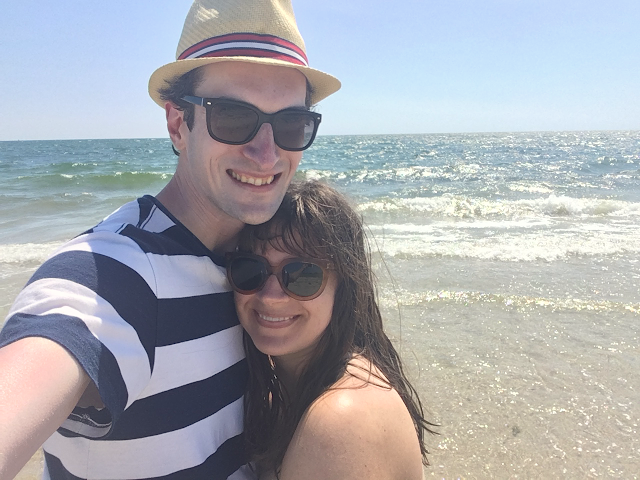 You can read about our Summer Vacation Kick-Off in Boston here. After a perfect 24 hours in Boston, we were Cape-bound. I'm not really sure why I love the Cape so much - living in New York, we have access to quite a few states that are water-side - we've been to Maine, Rhode Island and Connecticut, all of which are beautiful. But nothing, for me, compares to the Cape. It just holds on to a piece of my heart and fulfills my soul in ways I can't explain. 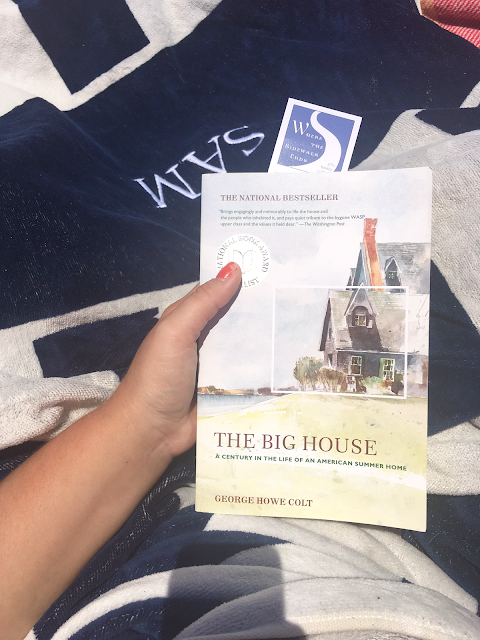 It could be the childhood attachments and memories, or the fact that I love New England, and to me, the Cape is perfectly New England in all aspects. It could be the restaurants and the options to island hop to Nantucket and Martha's Vineyard. 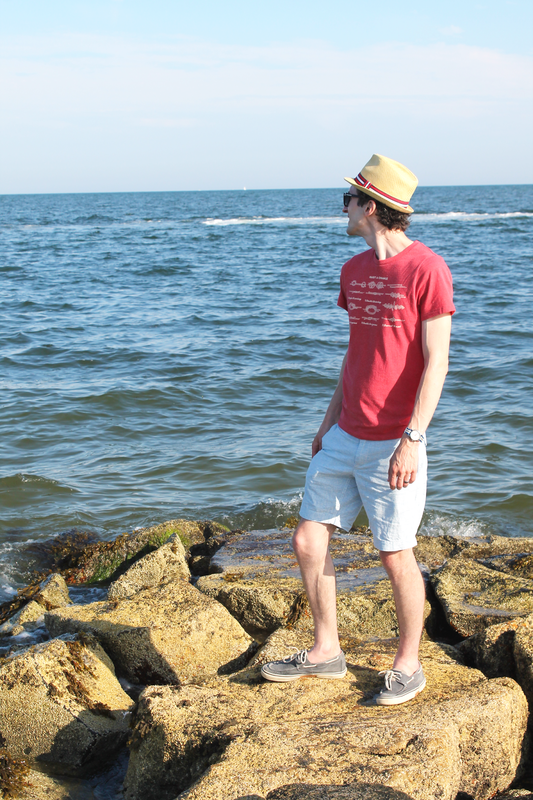 It also could be its proximity to Boston, making vacation a great mix of both urban and ocean. It could be the beaches, which make me feel like I'm miles away from my every day life. 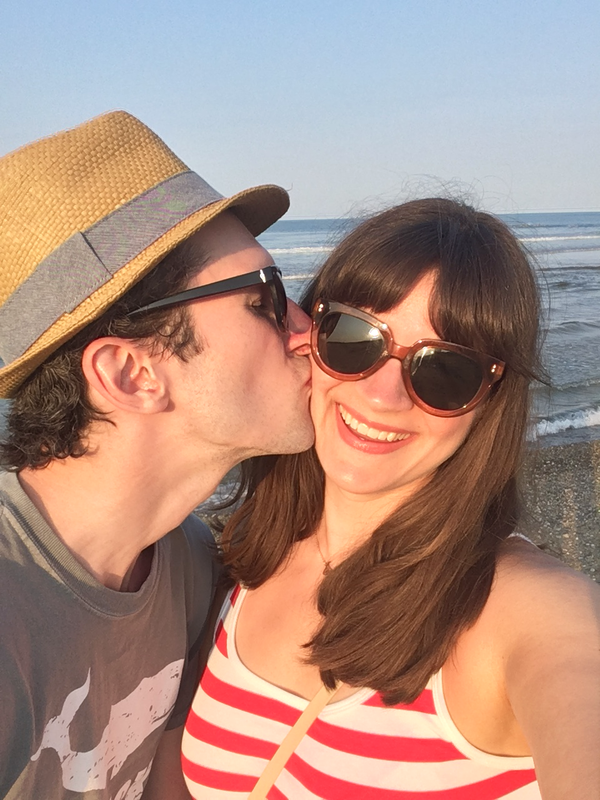 I love that the Cape is a true, relaxing vacation - we know so much about it now that it requires almost no planning. We roam through the different towns, shop at the boutiques, take long walks on the beach, or just stay at the ocean all day. We take a book with us to get lost in during down time. Fresh seafood for dinner (well, for me), and some of the best ice cream every night. It's perfection. It's all I need in a vacation. It's pure summer for one week. Anyhoo, let's do a little recap, shall we? We started a tradition two years ago to have dinner our first night at a restaurant in Yarmouth called The Skipper. 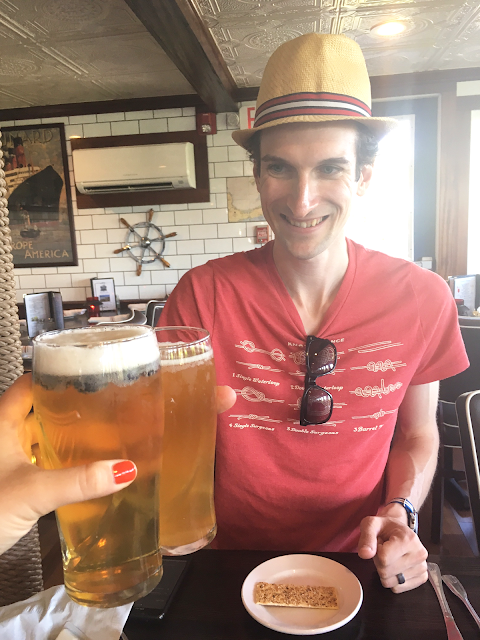 It's not especially amazing (although, it's very good), but they have quite a few veggie options for Josh (including nachos - his favorite) and one of my favorite cups of clam chowdah on the Cape. They even offer fried clam chowder cakes, which I always have every intention of trying, but always end up ordering traditional chowder. Across the street is the ocean, and walking along its shore is the perfect way to digest our dinner and celebrate our first night. A "cheers to vacation" at The Skipper. 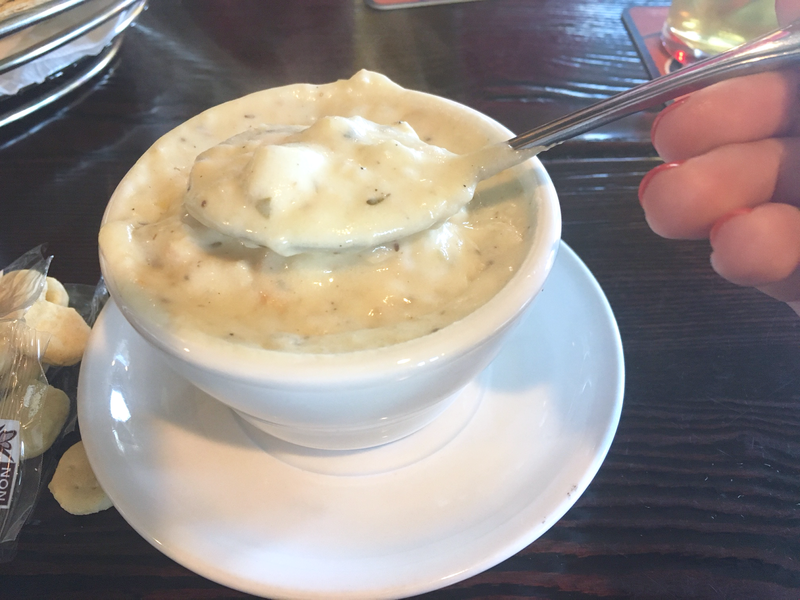 Clam chowdah at The Skipper. It's so thick and creamy. 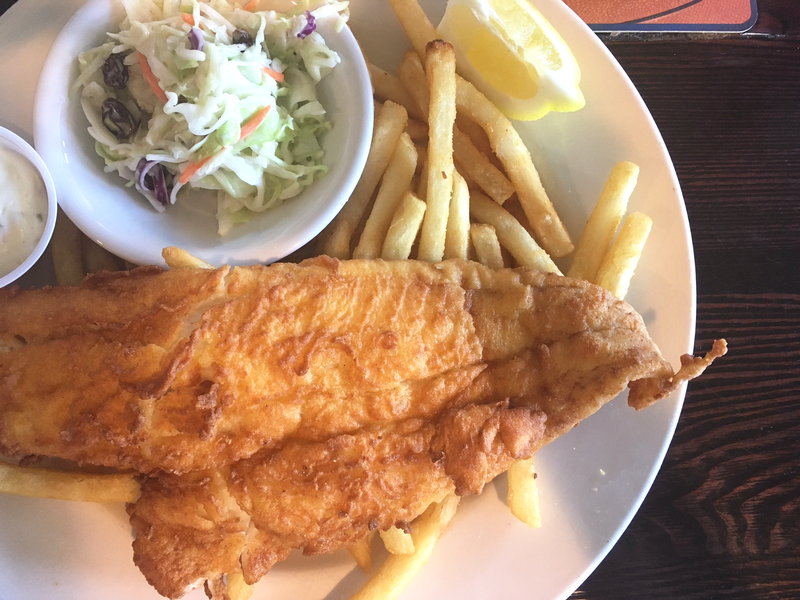 Fish and chips at The Skipper. 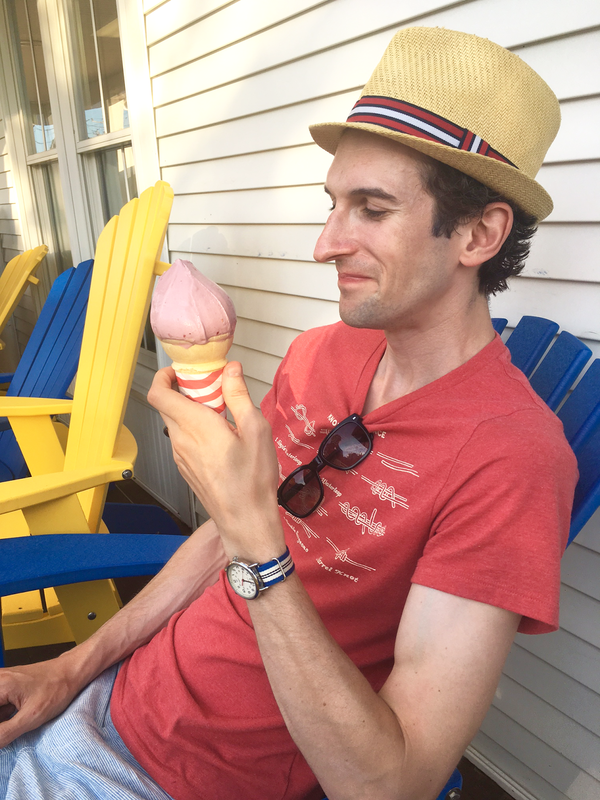 We usually do our first ice cream cone of the week at the Cape Cod Creamery in Yarmouth, which is definitely top four on my list (yes, I have a top four - stay tuned). 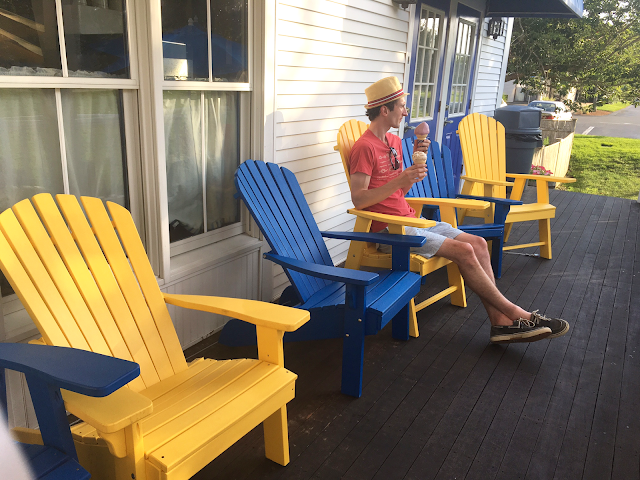 You can always spot it by the colorful adirondack chairs lining its front yard. 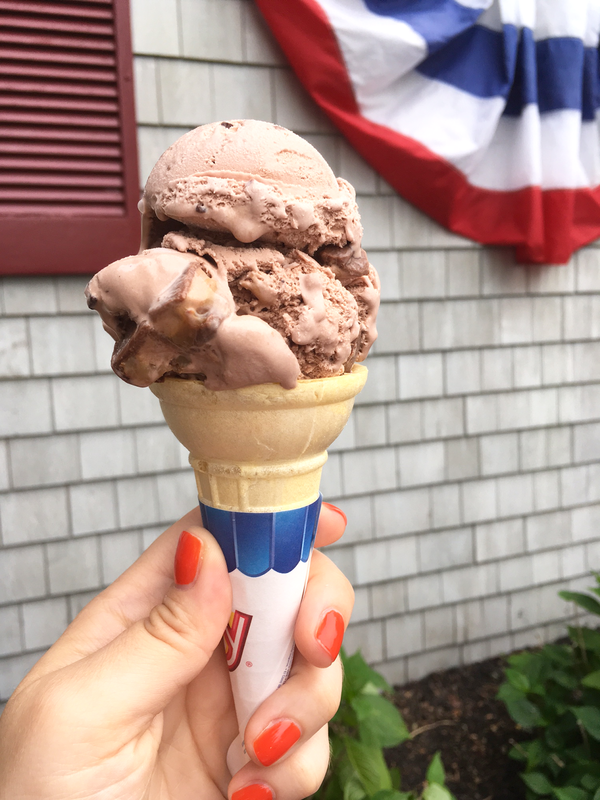 Their ice cream flavors are named after Cape Cod things, and I usually go with Sandy Neck Snickers, but all the flavors are ridiculously enticing. 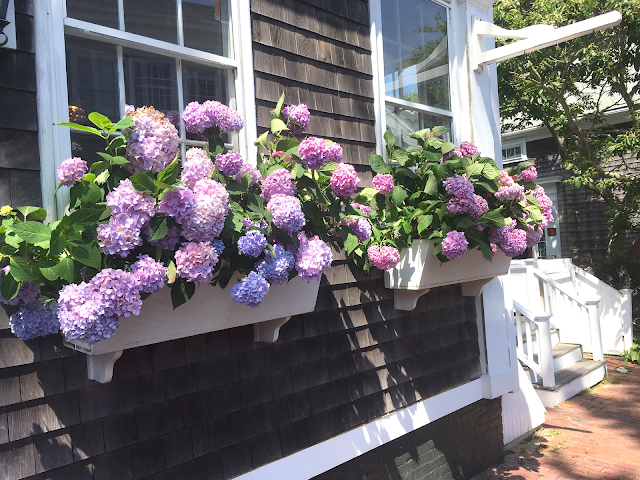 Front porch at the Cape Cod Creamery in Yarmouth. 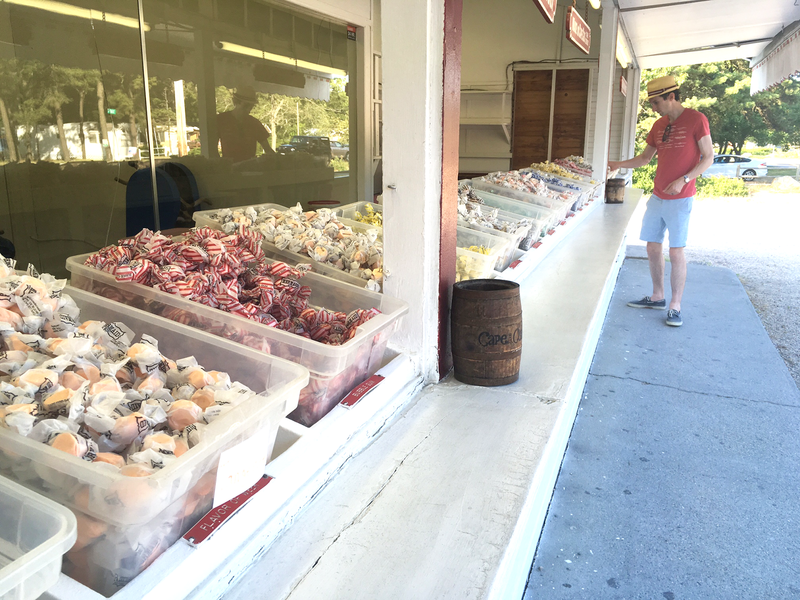 Because we haven't eaten enough yet, and because we're in the area anyway, I love stopping at this outdoor salt water taffy stand to get a few pieces for the week. 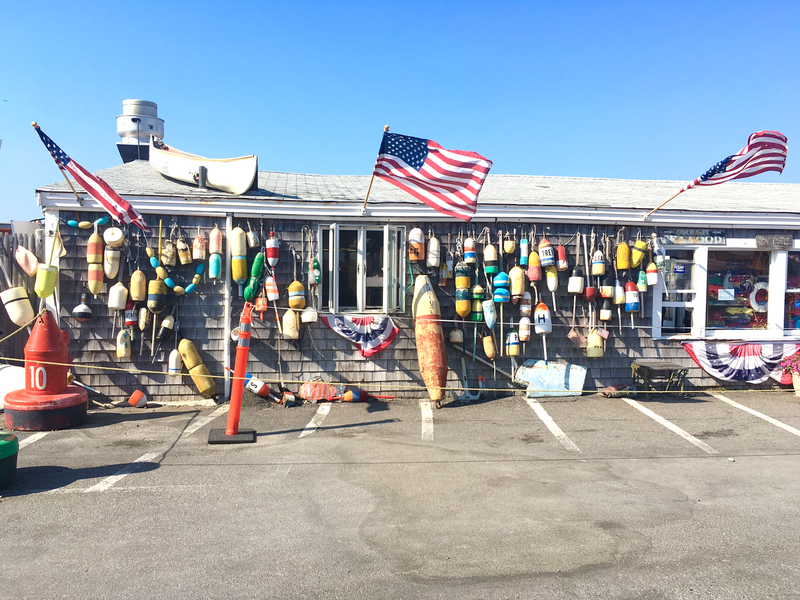 This stand has a really creative name - Cape Cod Salt Water Taffy - but it's a really cool open-air stand with tons of flavors and it's a fun little stop to make during your travels. Cape Cod Salt Water Taffy stand in Yarmouth. We also have a tradition of ending our first night by watching the sun go down at Bass Hole Boardwalk since we're in Yarmouth for dinner. 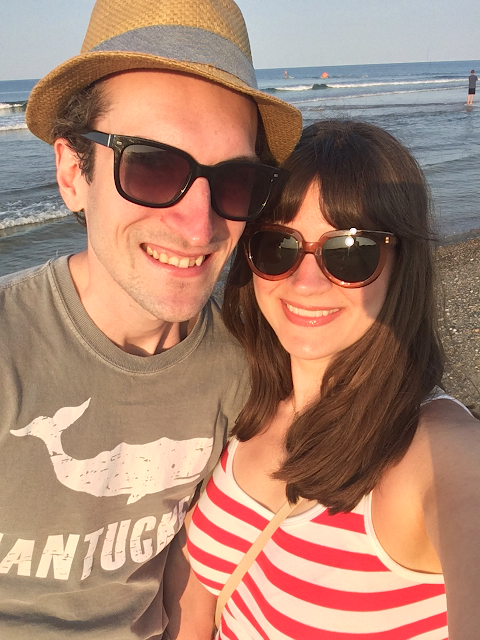 Although, it's not too much of a tradition because it's not something we've been able to do since our first visit together four years ago. Every night we'd try to visit in the past three years, it was too cloudy and overcast the night we were there, and there was no sunset to be seen. But this year, it was perfect with only a few whispy clouds in sight. It's one of my favorite sunset-watching spots on the Cape and definitely worth the trip. The marshes surrounding it are so serene and the whole experience is rather picturesque. 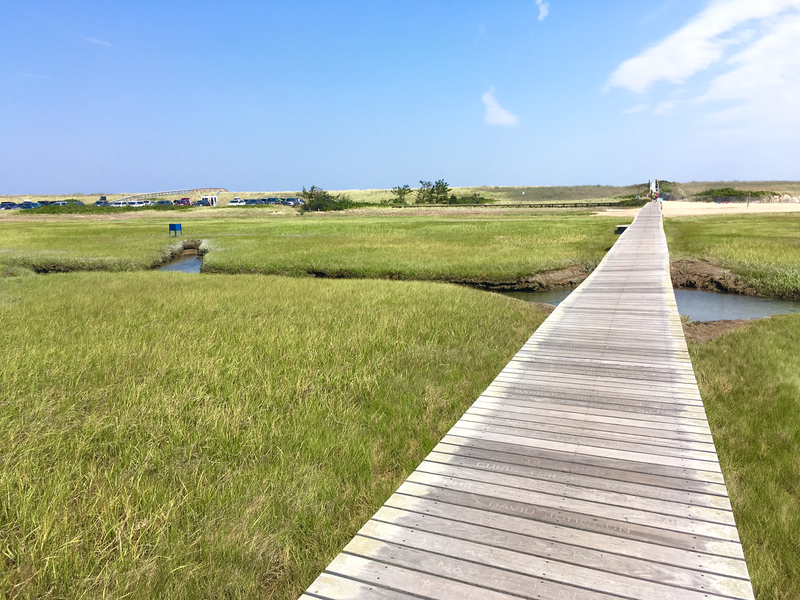 Bass Hole Boardwalk in Yarmouth. 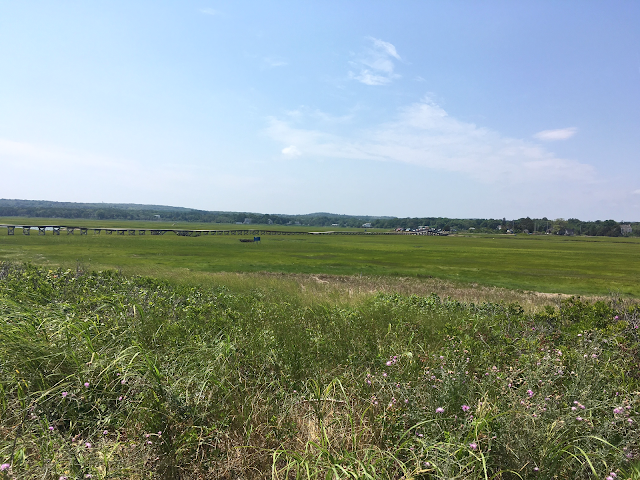 The marshes at Bass Hole Boardwalk in Yarmouth. On our second day, we usually spend the afternoon in Chatham. 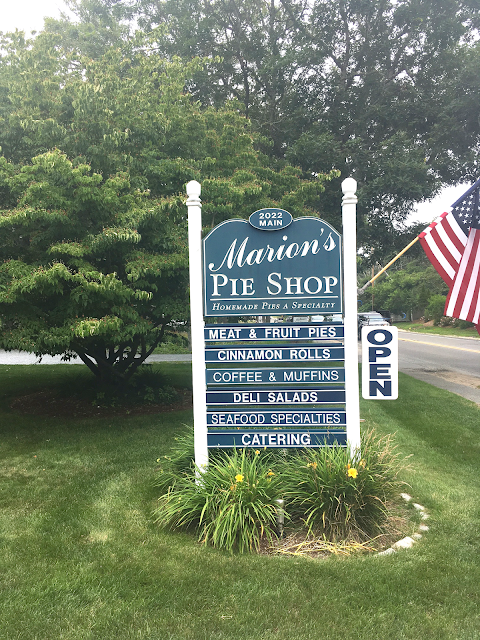 We plan it this way because Chatham is home to Marion's Pie Shop, and we pick up a cherry pie to enjoy throughout the week. 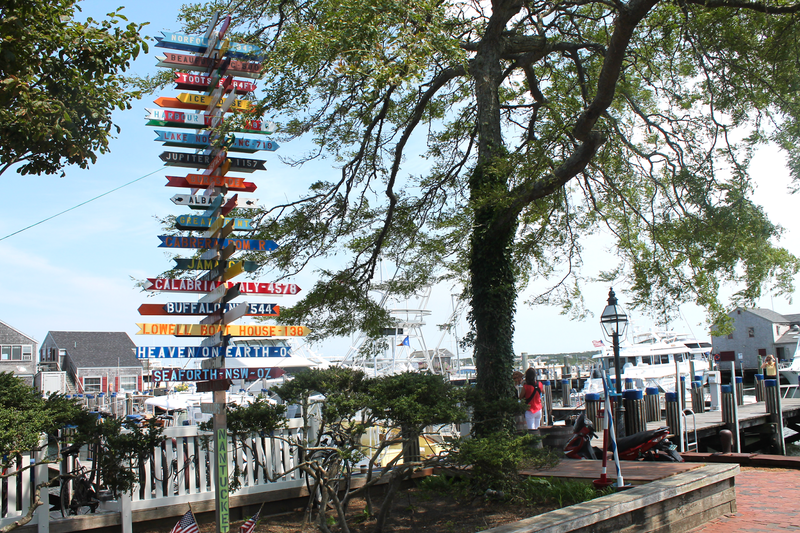 Chatham has the best of both worlds - an amazing little shopping district with a mix of high-end, lovely boutiques and tourist necessities, but it also has beaches and plenty of seaside things to do. We usually grab lunch at The Squire because it's right on the main street there (I really enjoy their lobster roll, and they have a veggie burger for Josh), and then just meander through the shops the rest of the afternoon before heading out to Marion's to get our pie for the week and go back to the cottage before dinner. We have to pass through Harwich Port on our way back, so if we have time, we'll swing by there to explore the shops. We don't make many plans for the rest of our trip, and take it day by day. Mostly, we're just lazy turds (#truestory). We usually budget a day to visit Nantucket (last year we did both Nantucket and Martha's Vineyard, but I'm planning a whole separate post on the two islands because I have a lot to say). We like to try and stop at a bookstore and buy a book to read on the beach during the week (a new tradition we started last year on Block Island), and there are great bookstores scattered all over the Cape, so they're pretty easy to come across. 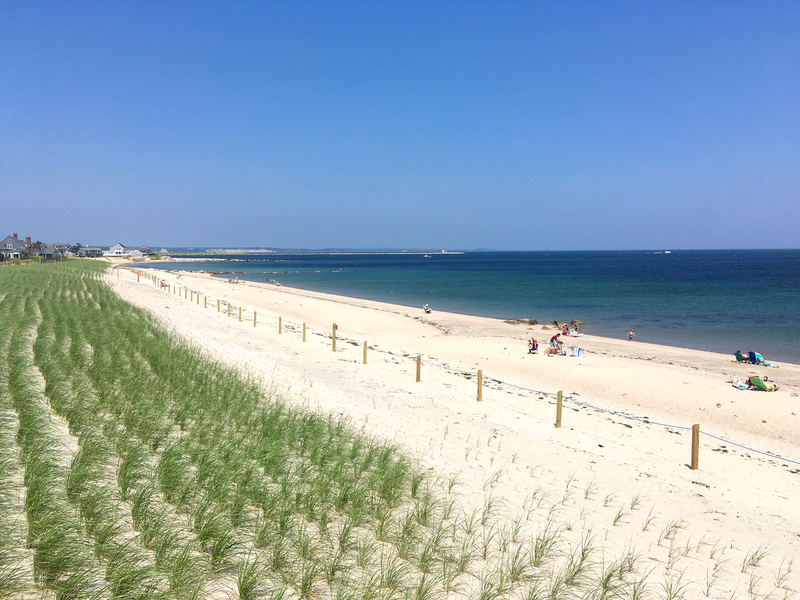 For the rest of this post, I'll break down our favorite beaches, restaurants and sites to see, and our tips for enjoying your Cape vacation. 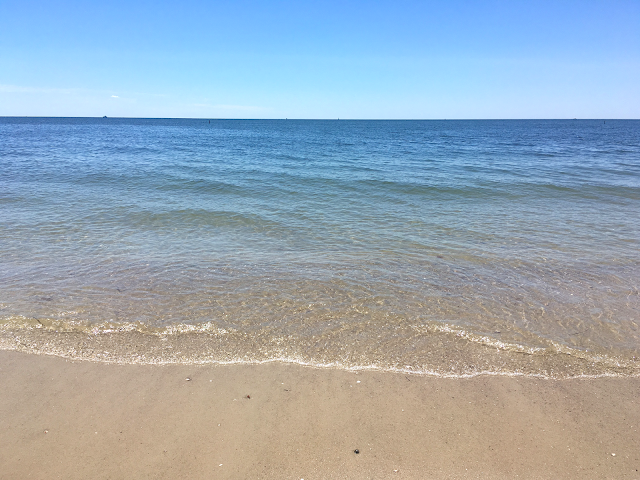 As far as beaches go, I have a few favorites on the Cape: Bank Street Beach in Harwich Port, Nauset Beach in Orleans and a new tied-for-second, Coast Guard Beach in Eastham. I have two honorable mentions that I'll touch on below. Bank Street Beach is pretty small in comparison to most of the well-known beaches, but that's kind of the reason I love it. It's not as overwhelming because it's more of a locally-populated beach, and because it's on Nantucket Sound, as opposed to the Atlantic, the water is warmer. While a lot of Nantucket Sound beaches are rocky and seaweed-y, Bank Street Beach is very sandy and not too seaweed-infected. It's surrounded by private beach access on both side, so it also makes for a great non-crowded walking beach since the private access makes the coastline less populated in most areas. It's also where Josh and I had our photos taken a while back, so it holds a special place in my heart. Bank Street Beach requires a parking sticker to park your car in the lot, but if you pack lightly enough that you can carry everything with you, there's free municipal parking in town, and from there, it's only a little less than a half mile walk to the beach. That's what we usually do because it's just the two of us, and the walk isn't bad at all. If you have kids, I'd recommend just biting the bullet and getting the parking sticker for the week. Bank Street Beach in Harwich. 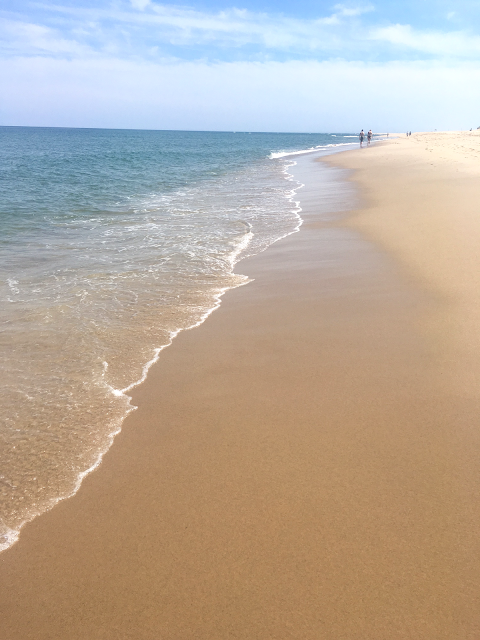 I love Nauset Beach for the waves. 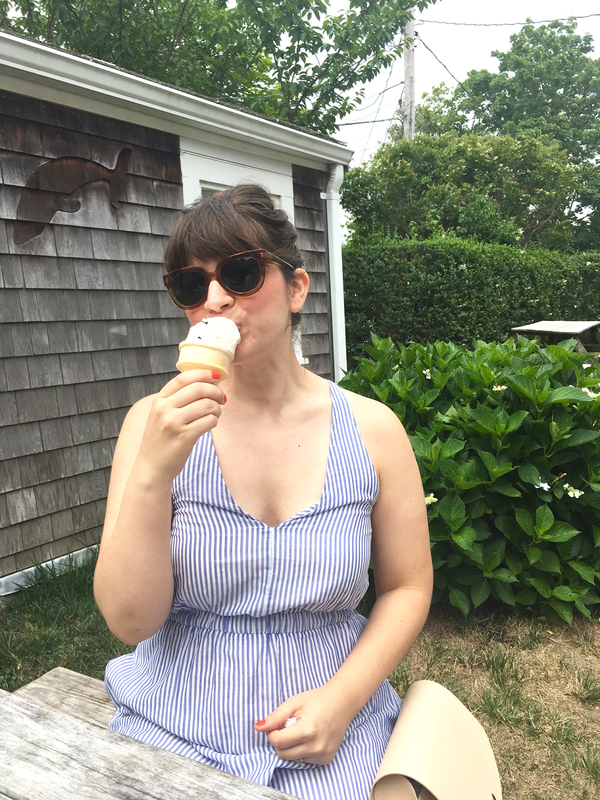 My very first year back at the Cape as an adult, we visited Nauset on a very wavy day, and I was literally thrown everywhere while I was in the water, and was cut open on my stomach, legs and knees by rocks, and I didn't even care. 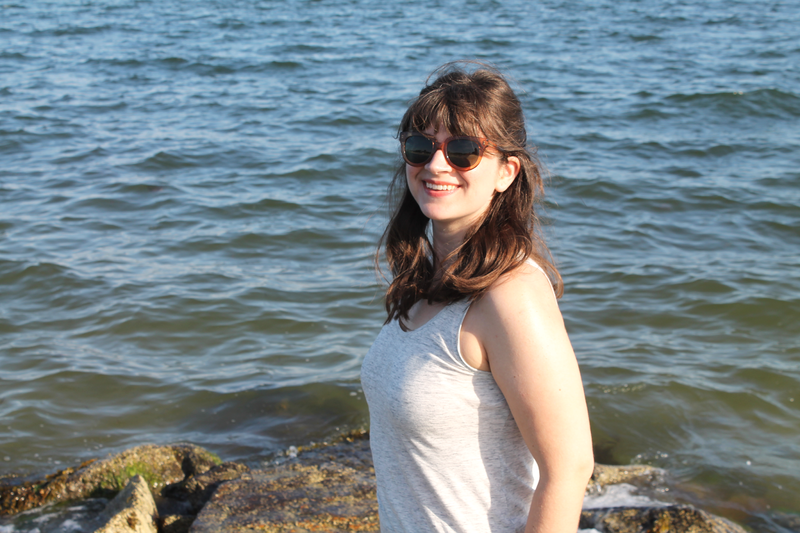 I had so much fun swimming in the gigantic waves, and I was nothing but smiles that day. I have a picture of it somewhere, but I can't seem to find it at the moment. Anyway. 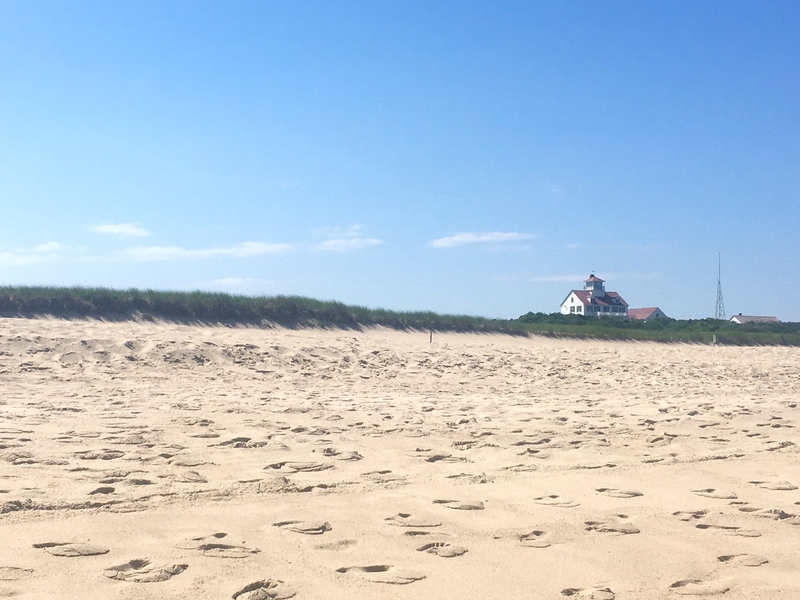 I will say, though, as much as I love Nauset, we visited Coast Guard Beach this year for the first time, and I loved it just as much as Nauset. The waves are about the same, and it was less crowded than our trips to Nauset, which made for more relaxing walks on the shore. We also had some seal sightings while at Coast Guard, and they came up pretty close to us humans swimming in the water! At one point while in the water, I heard someone on shore screaming, "Look! Look!" and I turned around to face Josh, and there was a seal with his head above water about 8 ft. or so behind Josh, and Josh totally missed it. It was also the one day I forgot to charge my GoPro and totally missed the best photobomb ever. The only downside with Coast Guard is that you have to park in a lot a few miles away, and take a beach shuttle to and from the the parking lot. Not a huge deal, but it's a bit more time consuming. Overall, though, the views at Coast Guard and the seal sightings make it a must-visit. A close third for me, is Mayflower Beach in Dennis. It's a really lovely family-friendly beach with calm, warm waters and a tide that can end up about a quarter mile from where you landed your beach blanket by the time you leave. It's a really cool experience for a more tame beach visit. It's great for walks because of the low tide in the afternoon, but if you're looking to ride the waves or do any swimming, it's not the most exciting. I'd recommend it for the kiddos and evening walks once the tide is out. 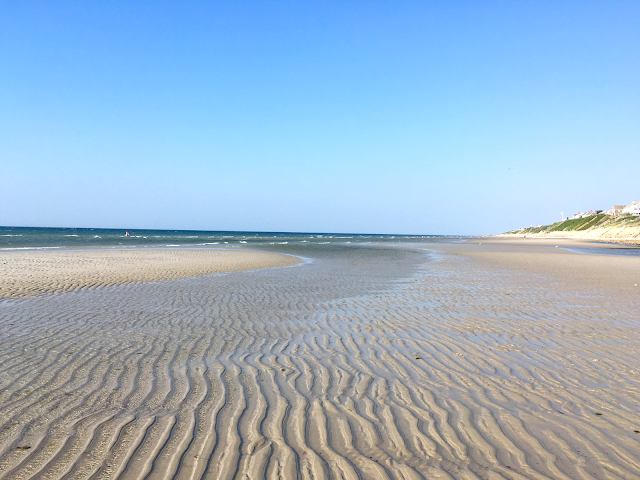 Mayflower Beach during low tide. All this sand was covered in water earlier that day! This year, we explored Newcomb Hollow Beach in Wellfleet. 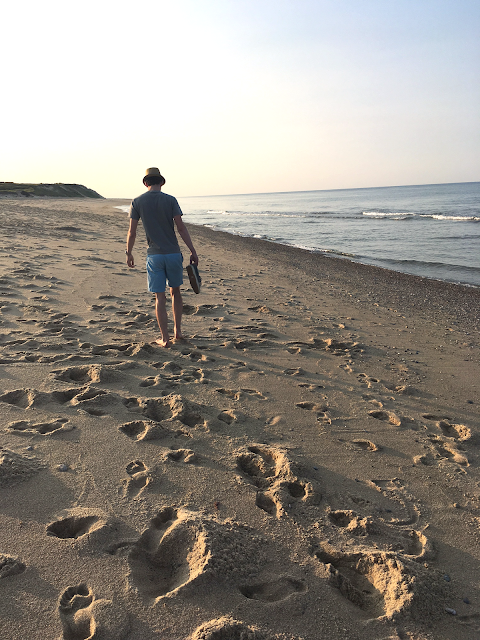 We had to kill some time in Wellfleet while we waited for our sunset sail charter to start, and we decided to drive over to this beach for a walk. And I'm so happy we did. It was gorgeous. Perfectly scenic and almost abandoned, we walked a little ways out, and there was no one near us. The sunset was beautiful (although, it sets behind you on the cliffs, not over the water, but still, the air was flooded with yummy amber light), but we felt like the only two people on the planet during our walk. It's hard to say this is a favorite because we only spent about 30 minutes here, but next year we plan to go back and bring a picnic dinner as the sun goes down, and maybe see if we can snag a fire permit to do a seaside firepit once it's dark. 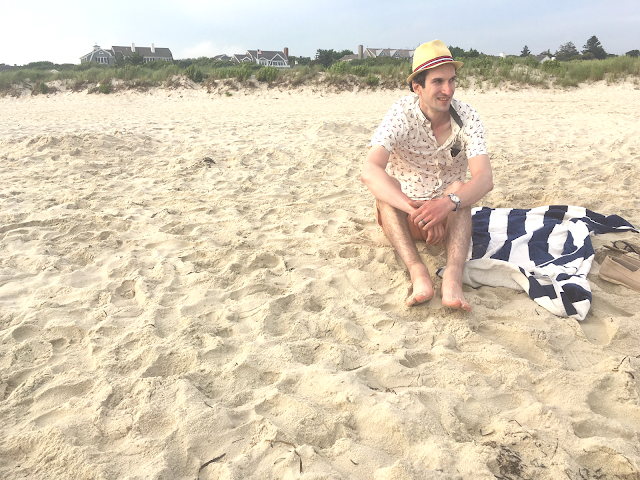 I've also heard great things about West Dennis Beach, but in our travels, we've never made it there, sadly. 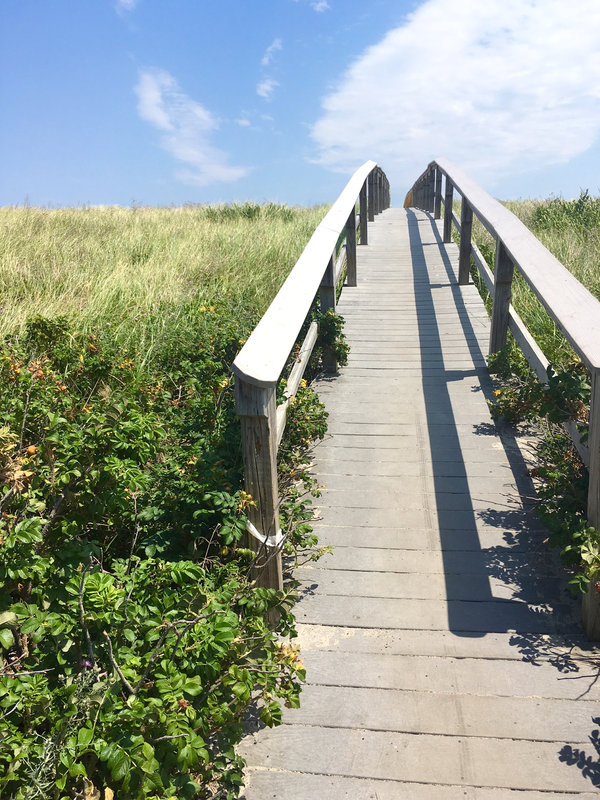 We've been to a few other beaches on the Cape, but that's a round-up of my stand-outs. It's kind of hard to find a disappointing beach, though. 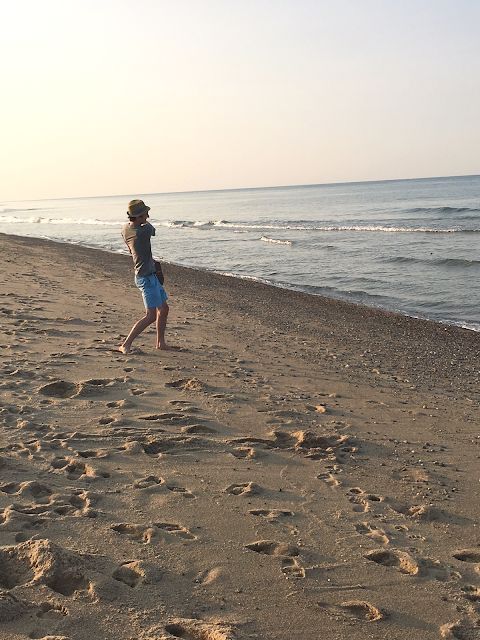 Beach tips: Many town beaches and National Seashore beaches will charge about $20 to park. Some beaches, like Bank Street in Harwich Port, require a town sticker on your car to park. If you're going to pay to park, make the most of your beach day, and get there early. We've had to wait in a car line before because lots were full, and you literally just sit there waiting for someone to leave to get a parking spot. We're usually at the beaches by 10 a.m., and we always get a spot. This isn't an issue if you walk to beaches, though, which is one of the great perks about Bank Street. One caveat, though, is that most beaches stop charging for parking, or stop checking car stickers, after 4-ish p.m. For Mayflower I think it's 4:30 p.m. I'm not sure what the exact times are for each beach, but chances are if you go to a beach after 4:30-5 p.m., you can park in the lots for free, and without a sticker. We do this a lot to spend as much time at the beaches as possible. 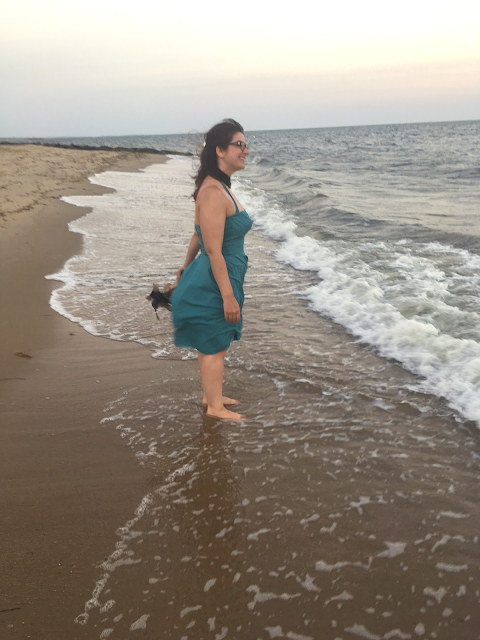 Even if we spend the whole day at the beach to swim, read and eat lunch, we'll go back after dinner to watch the sun go down, or just go for a sunset walk on the shore. And because you can park for free, you can pick whatever beach you want! 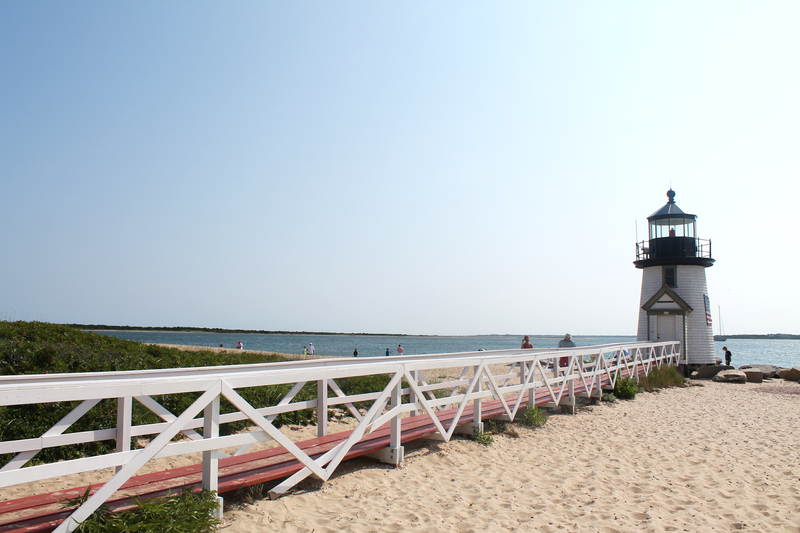 I, personally, have two favorite towns on the Cape: Harwich Port and Chatham. Chatham is known for being a bit more of a shopping destination, and that's one of the reasons I love it. It's picturesque, charming and historical. You can visit an old windmill that was build in the late 1700's, go shopping at some lovely boutiques, grab lunch at your choice of several lovely restaurants and hit up the oceanside fish market and beach on your way home. The fish market at the pier is definitely worth a stop. It's easy to spot seals there, and it's also really fun to watch the fishing boats come in with their catches of the day. There's a restaurant right there as well that serves fresh and amazing seafood dishes. 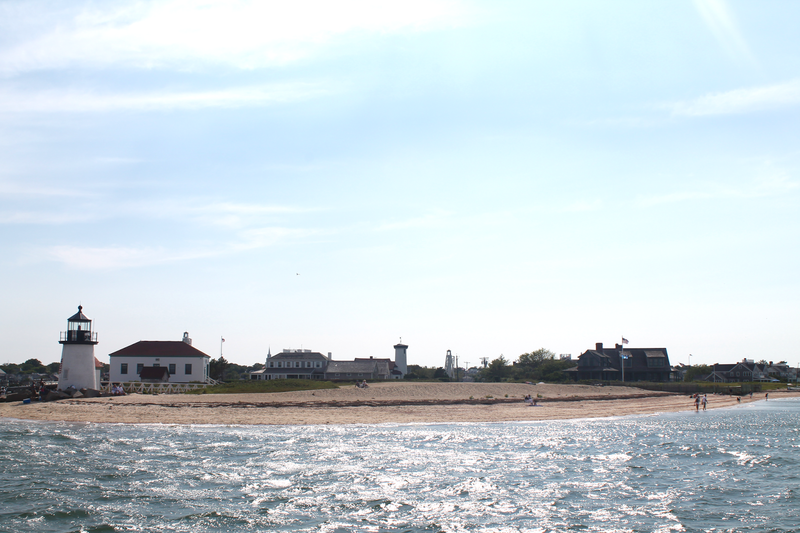 Harwich Port is home of the aforementioned Bank Street Beach, which is walkable from the main street in town. It's a small little town, but has some really cute little shops and eateries. I really love Ember, which is a coal-fire pizza place with a really fun fire pit on their dine-in patio. 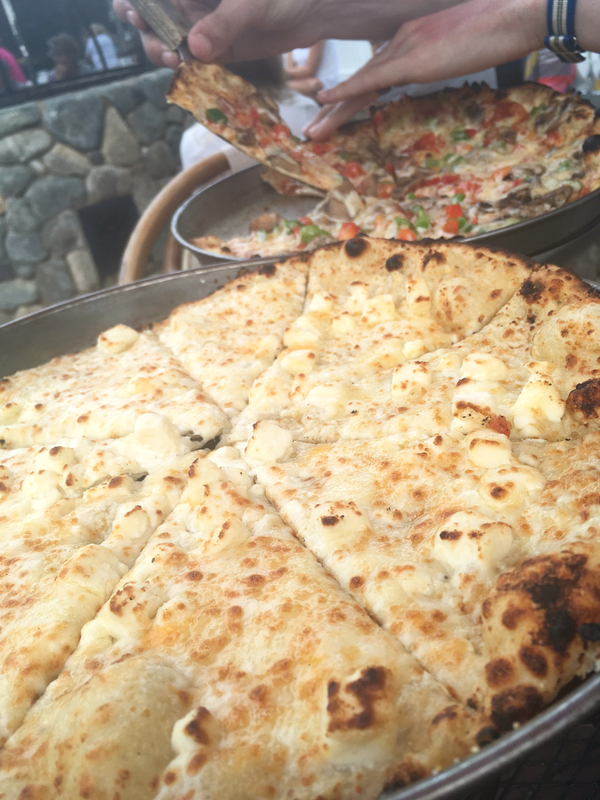 They have this really great grilled peach salad that we can't ever resists getting, and all different kinds of pizzas. And, AND, my favorite place for ice cream, Sundae School, is right next store (ice cream will be its own topic for obvious reasons). Sandwich is also a fun town to walk around. 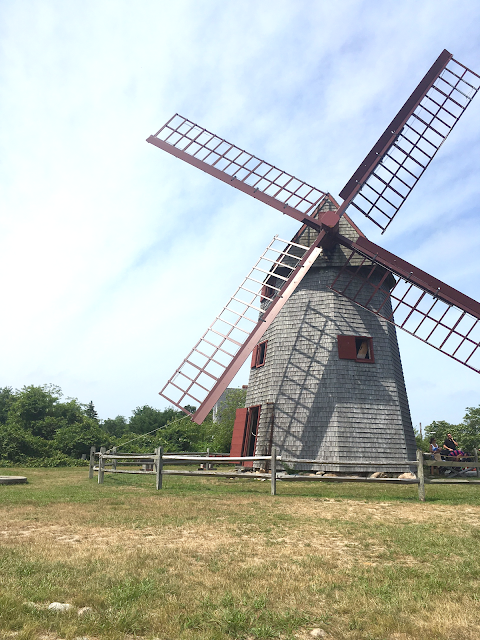 They have an old Grist Mill that's very lovely, and the oldest surviving house on the Cape, called Hoxie House, which is a fun little walk in town. They also have some great eateries, a few cute shops, a great antique store and a boardwalk that connects you to Town Neck Beach. Bridge to Town Neck Beach in Sandwich. Town Neck Beach in Sandwich. Provincetown is kind of a must if you've never been. It has everything: the feel of a sleepy coastal town that's still lively with nightlife, busting with a unique energy all day every day, and great shops and restaurants. 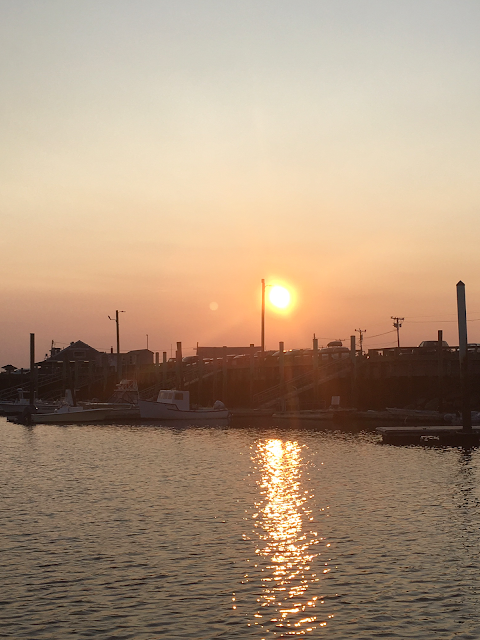 You can walk down to the marina and look at the docked fishing boats, walk down Commercial Street, the center of Ptown, and meander the side streets for some local flavor. My favorite restaurant in Ptown is Ross' Grill (they have a shrimp po' boy to literally die for), and it's indoor seating overlooking the ocean. ICE CREAM. Ohmigod, the ice cream on the Cape is so good. I have four favorites: Cape Cod Creamy (Yarmouth - mentioned above), Sundae School (Harwichport, Dennisport & Orleans), Schoolhouse (Harwich) and Buffy's (Chatham). Most of them are ridiculously over-priced, but also, ridiculously worth it. We spend a small fortune on ice cream on vacation. Josh's favorite is Shark's Tooth at Sundae School, which is black raspberry and white chocolate chips. Sundae School usually has some kind of candy bar ice cream, and I always cross my fingers for Milky Way (not sure why). Buffy's has the most amazing Mint Chocolate Chip with huge chocolate chunks that give me all the heart eyes. Schoolhouse portions are huge and a small cone will make you feel like you just ate Nantucket island (in a good way). If I had to pick just one, I'd go with Sundae School. One, it has a cute name (the back of their t-shirts say Don't Skip Sundae School). Two, the ice cream is consistently reliable and amazing quality. Three, the variety of flavors is amazing. They'll always have at least three flavors you can't decide between. Mint Chip from Buffy's in Chatham. The picnic tables outside of Buffy's in Chatham. When you're double-fistin' it at Sundae School. Milky Way at Sundae School. Tip: More of a head's up. Sundae School can get pretty busy in the evenings. So busy that they actually have people directing cars in the parking lot. 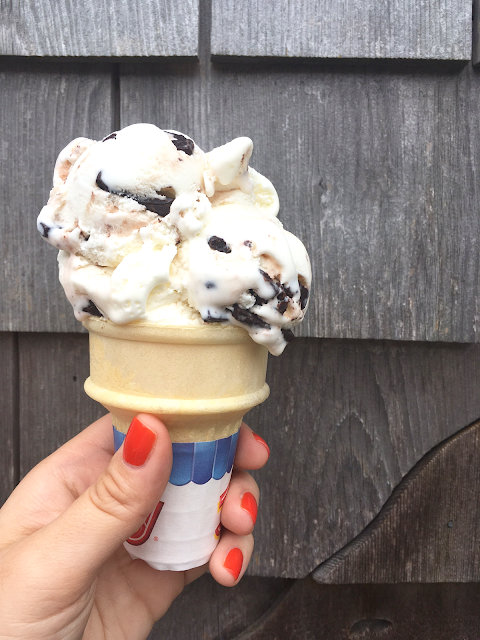 If you can find a place to stay that's walkable to Sundae School, then you've hit the jackpot. Unless you don't get as excited about ice cream as me. Then you don't need to worry about that. For this seafood-loving girl, the Cape is heaven. For people like Josh who have too much love for our sea-dwelling creatures, and choose not to eat them, it can be tough. We usually dub Cape Cod week "Onion Ring Week" because being a vegetarian, Josh pretty much can only eat onion rings and the side salad on all the seafood shack places I like to go. We try to diversify when possible, but the seafoods shacks are a must, you know? Give me a big paper plate of fried clams and scallops and fries and 'slaw and then take me to the nearest ice cream place! I've found that it's really hard to get bad seafood on the Cape. We've even Yelped and Trip-Advisored restaurants that were a 3.0 or 3.5, risked going anyway out of convenience, and found them to be really good. Some places are obviously better than others, but it's really hard to get a total dud. My personal favorite low-key seafood places are Summer Shanty in Dennisport (right on a marina with a great view of the sunset, adirondack chairs outside to wait for your table and very basic fried seafood fare), Original Seafood in Dennis (an order at the counter, take to your table kind of place) and The Dog House, also in Dennis (also an order at a counter and find your picnic table place). 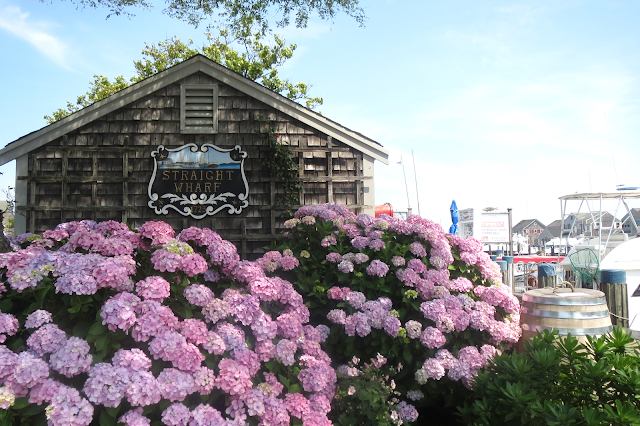 The Marina at Summer Shanty in Dennis. For pizza, we love the aforementioned Ember in Harwich Port. 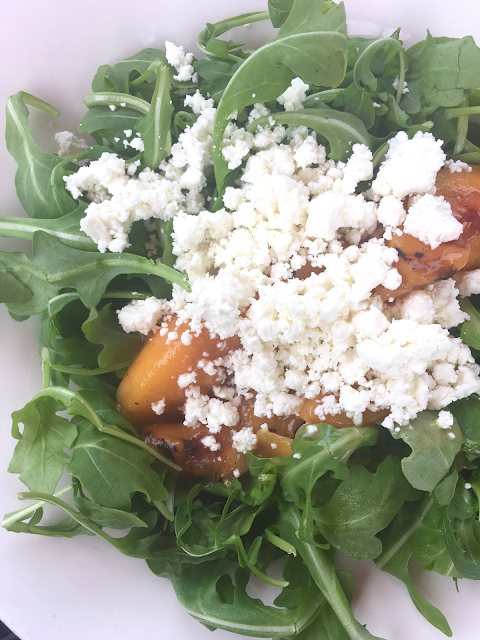 Grilled peach salad at Ember in Harwich. Pizza at Ember in Harwich. 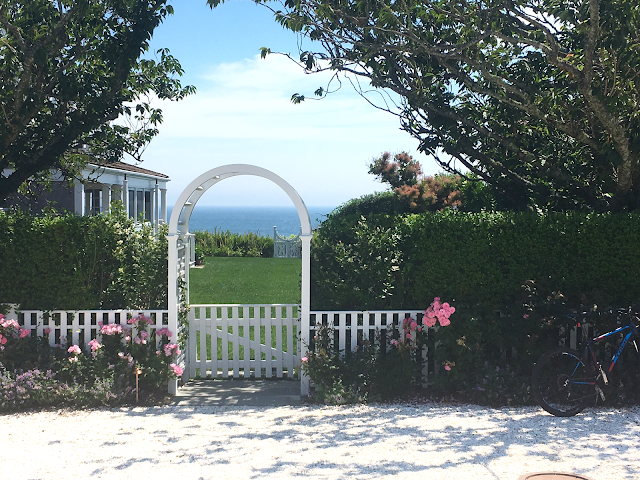 For a special occasion, the Ocean House in Dennis is hands down my favorite. The restaurant is a bit more upscale, so you can totally use it as an excuse to dress up, and it's literally right on the ocean. Most tables have a perfect view of the ocean, but the seats further back unfortunately have pretty blocked views. We always go here on my birthday, and have sat in all different areas. One year, we were seated all the way back, and being kind of short, I couldn't even see the ocean over the guy's head in front of me at the next table. I was kind of bummed. But then the following year, we were seated next to a window overlooking the shore, and it was perfect. This year, we were somewhere in the middle, and had a great side-view of the ocean. 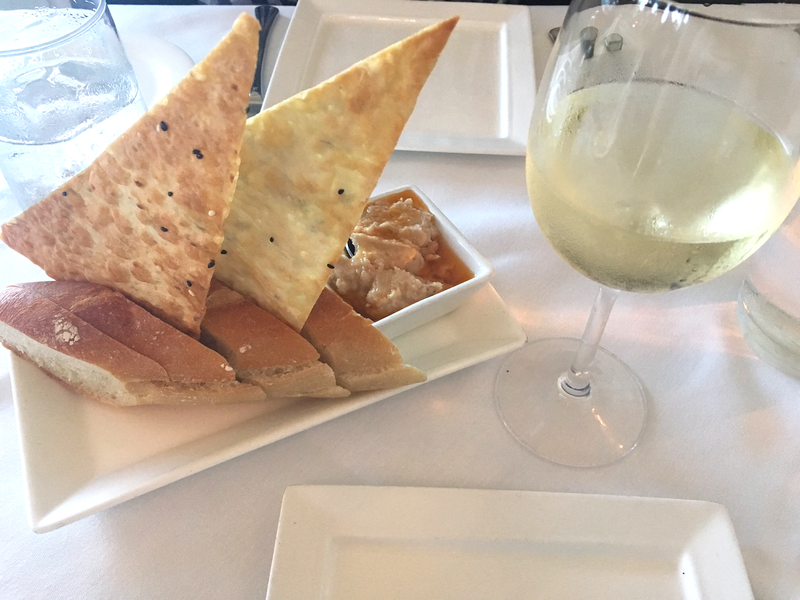 They have a diverse menu offering and everything we've gotten has been absolutely delicious. They also have a very casual beach bar outside next door so you can grab a drink if you arrive early for your reservation (and you'll definitely need a reservation!). 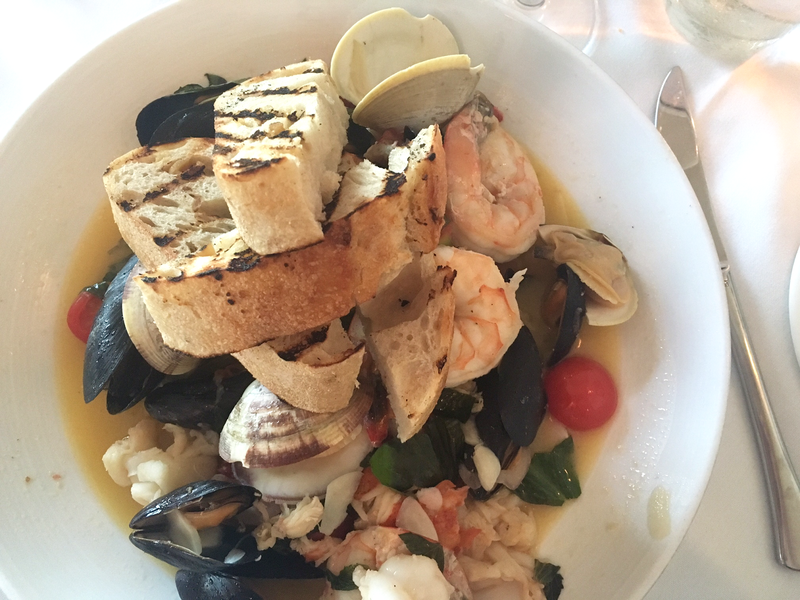 The seafood bruschetta at Ocean House in Dennis. 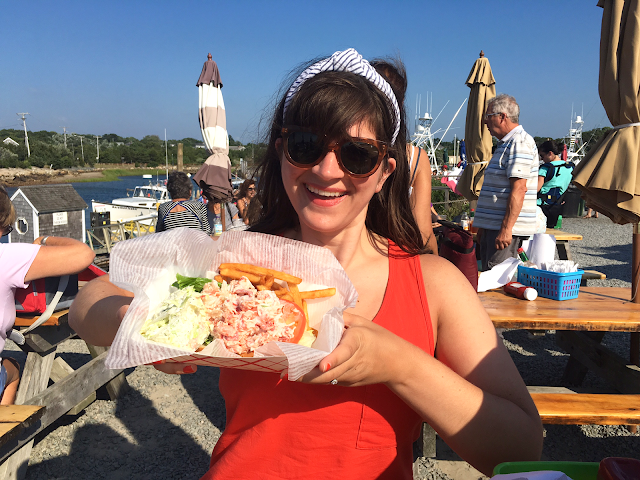 For the absolute best lobster roll on the Cape, visiting Sesuit Harbor Cafe in Dennis is necessary. 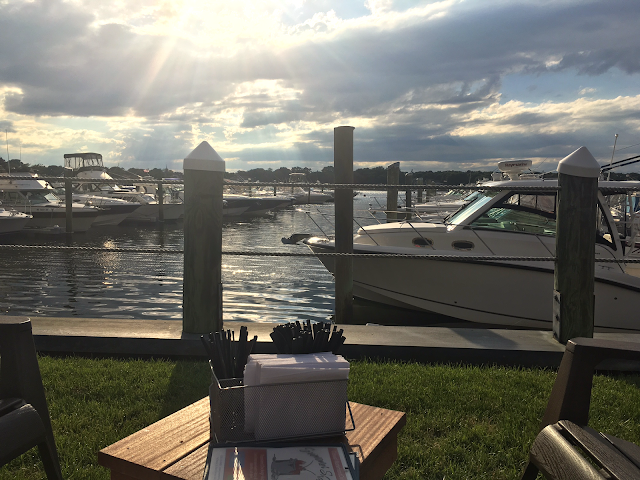 The wait is always long at peak hours, but for $19.99, you'll get a life-changing lobster roll, fries and 'slaw overlooking the water. And, it's BYOB, so you can bring a bottle of wine and make a night (or lunch) of it. This place is also a seat yourself at a picnic table situation, and because it's always hoppin', you may end up sharing a table with strangers. But, everyone's always happy here, so it's a good thing. Last year, we waited in line for about a half hour before getting to the counter to order, and we got there right around 6 p.m. This year, we got there super early (around 4:45 p.m.) and we got right up to the counter, just in time before people started to line up behind us around 5 p.m. When we left around quarter to six, the line was out the door again. 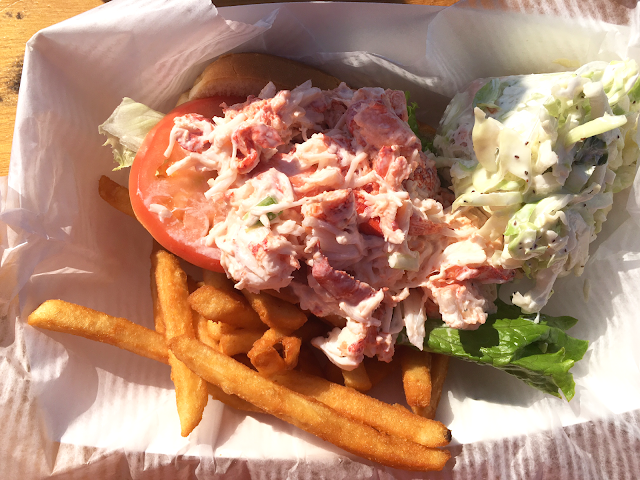 The lobster roll at Sesuit Harbor Cafe in Dennis. A new-to-us restaurant we discovered this year is Nauset Grill. Highly, highly recommend this place. 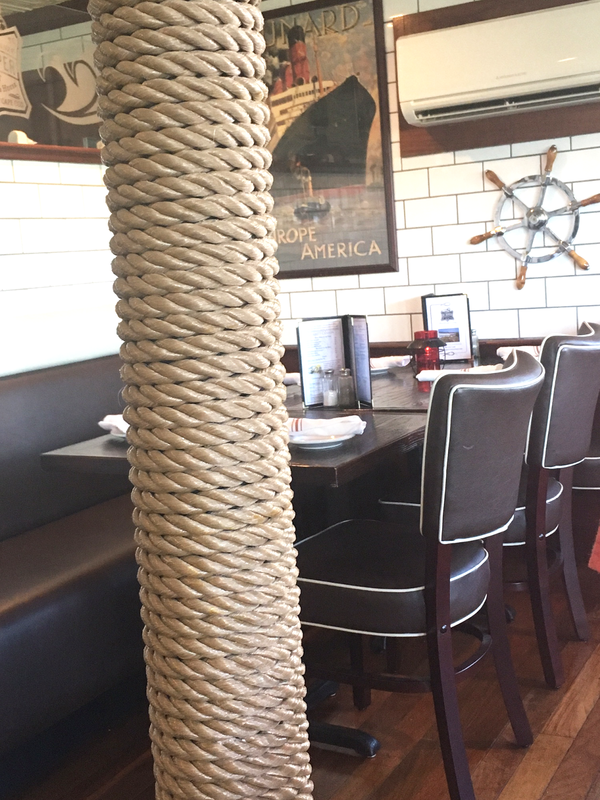 They have indoor seating, as well as picnic tables outside, and it's very casual. The food is so good here. They have a vegetarian menu (why we went), but the seafood offerings are incredible. 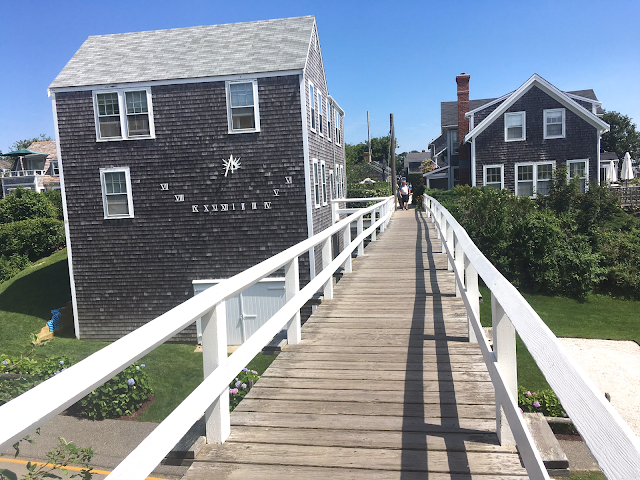 I got a cup of clam chowder, and fried cod tacos with the special Nauset sauce, and they were rather memorable in the best way possible. We also got the onion rings and fried pickles to share, and both were just so, so good. 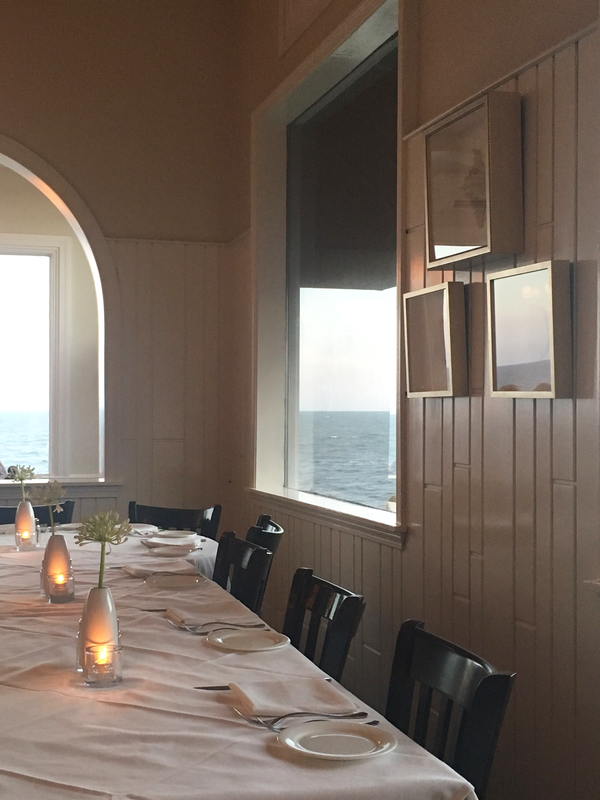 Tip: Most restaurants can get pretty crowded during peak season, so we usually try to make reservations ahead of time if we can (we always make reservations for the Ocean House weeks ahead of time). Or, if you want to wing dinner every night, you can do what we do, and go for early dinners. It sounds crazy, but on vacation we usually eat around 5 p.m. to beat the crowds. 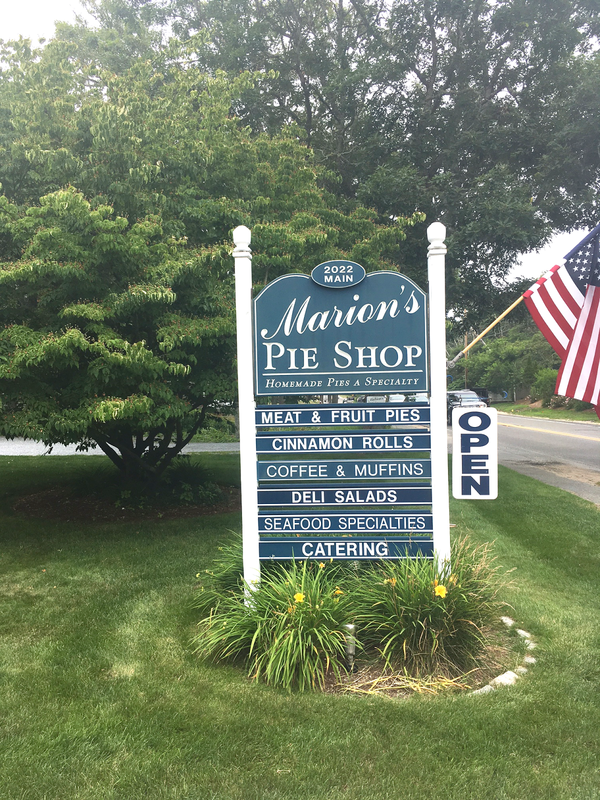 We're piggies while on the Cape, so we have an early dinner, head out for ice cream, walk on the beach, and go home for pie. No shame, my friends. No shame. And no regrets. Recommending where to stay is almost impossible because it depends entirely on your personal preferences, what you want out of your vacation, how long you're going, and of course, your budget. But I'll try to break it down as much as I can. If I had to make a recommendation, it would be to do a week-long rental in a house, cottage or condo. Most house-type rentals in the Cape are weekly (Saturday-Saturday) during peak season, so if you plan to go for the whole week (and I'd recommend that if you can), a rental is the best way to go, and here's why: I've compared pricing between week-long rentals and motels/hotels/inns and I've found rentals to be much more cost-effective. Hotels and such will charge you on average $200 per night in peak season, and you can rent a whole house, with a bedroom, kitchen and fridge for groceries, etc., for equal to or less than the nightly rate of a hotel for a week. And at these hotels that average $200 or so per night, you get a pretty basic room that doesn't feel super homey or special. If you only go for a long weekend, a hotel is probably more cost-effective, but do your research and the math. You never know what kind of rental you can find. Tip: If you're trying to decide between rentals that are nicer-looking or closer to beaches and restaurants, go with proximity. Our first year back as adults four years ago, we rented a big house that was really nicely decorated and very "Cape Cod." It was fun, but we were never in the house. 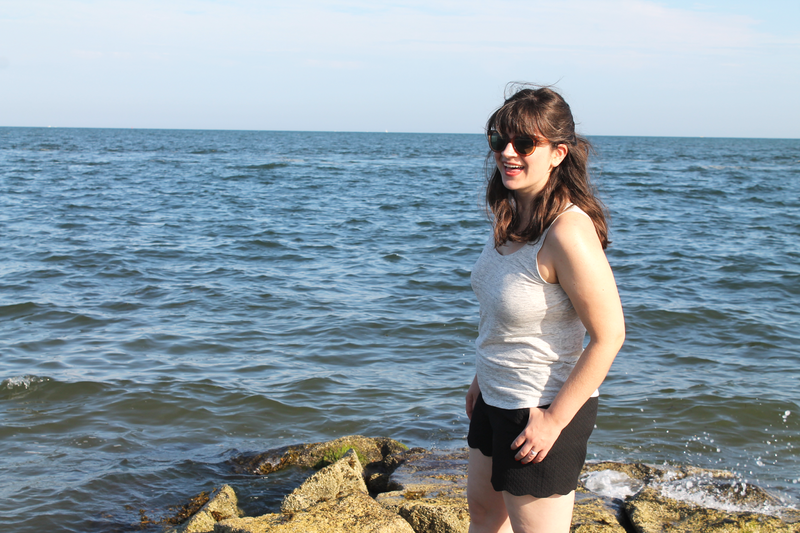 We were always out exploring the beaches and towns. 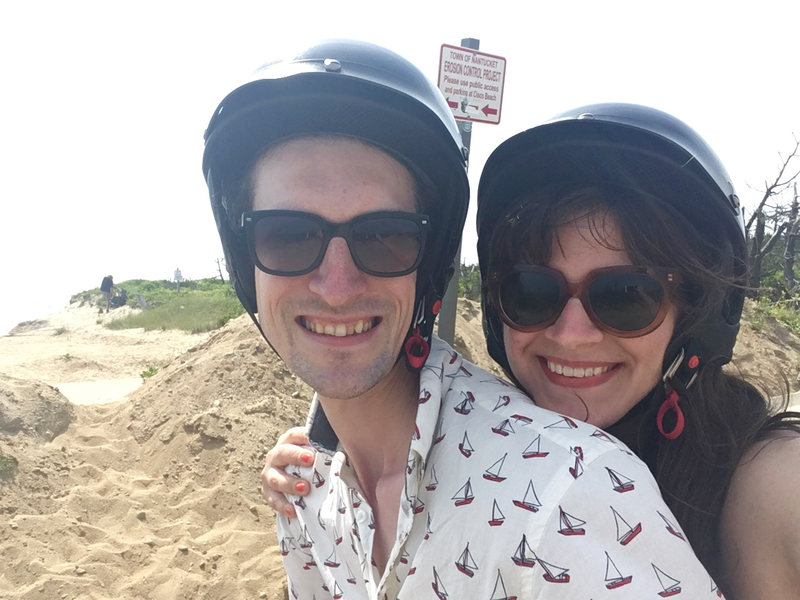 Every year since, we've made proximity to beaches (less than a half mile to the closest ocean beach and walking distance to at least 1-2 good restaurants) our biggest priority. The cottages we usually rent now are very small, basic (but homey) and we can walk to an ice cream place and restaurants, and to an ocean beach every night. Tip: All rentals have different policies when it comes to cleaning, bedding and towels. Some rentals don't provide sheets and towels, and some will charge you a cleaning fee. Be sure you understand all the policies of your rental beforehand, and pack accordingly. Tip: If you go with a rental, and you have a kitchen, this is a great way to save some extra money if you want. We usually bring things to have breakfast at the cottage, rather than going out, because we're not huge breakfast people (and would rather put our food budget toward seafood and nice dinners). There are also grocery stores all over, and you can buy things to pack beach lunches. But, remember to bring things like sandwich bags, plastic cups, etc. because these things can add up at the stores. But, if you forget them, not a big deal since you'll be able to find the necessities anywhere. We've never vacationed on the Cape during off-peak season, but I've seen rates dramatically decrease outside of peak season, and many rentals won't require a minimum night stay. Again, it's really hard to say. When I was younger, my mom took my sister and I to Truro, and we loved it there because we wanted to live on the beach, and our motel was ocean-front (as in, walk outside of our patio door, and we were on sand). 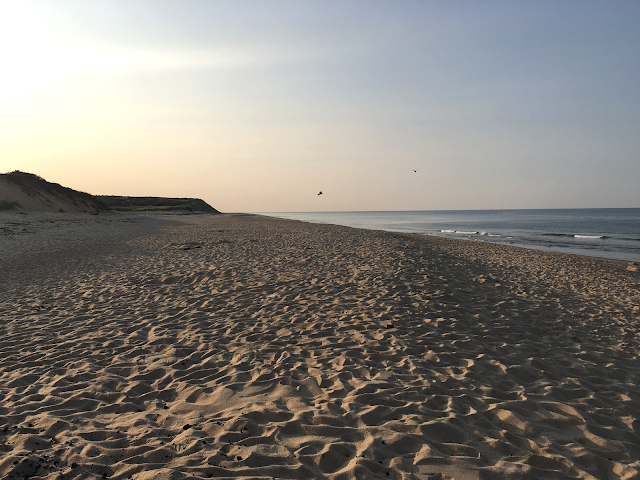 Many people like the Truro/Wellfleet areas because they're quieter and less populated (but also have fewer restaurant and shop offerings). As I'm sure you've guessed, we really like staying in Harwich Port and Dennis Port. 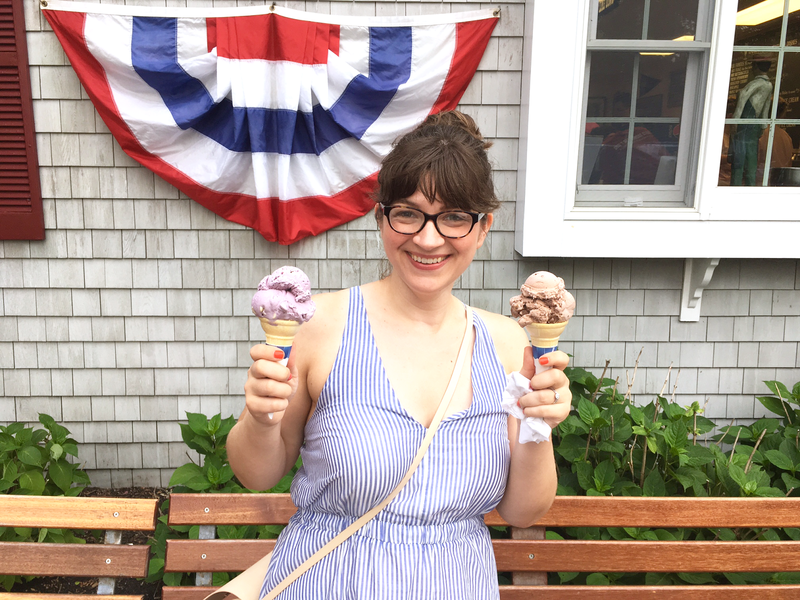 These two towns have a lot to offer as far as restaurants (both have a Sundae School, so yay! ), and both have beaches we can walk to if we plan our rental location strategically. 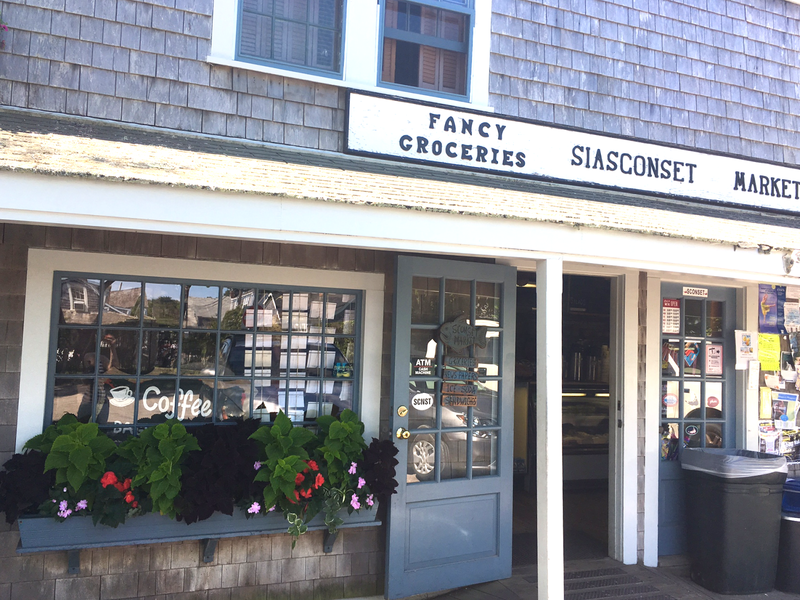 They also both have nice little shopping districts, and are easily accessible to Chatham. Ptown is a bit of a hike (about an hour), but we make a day of it if we decide to go up there, so that doesn't bother us. Tip: When looking for a rental, it can feel totally overwhelming. I like to tell people to decide what you want out of your vacation the most, and then pick an area that will offer that. 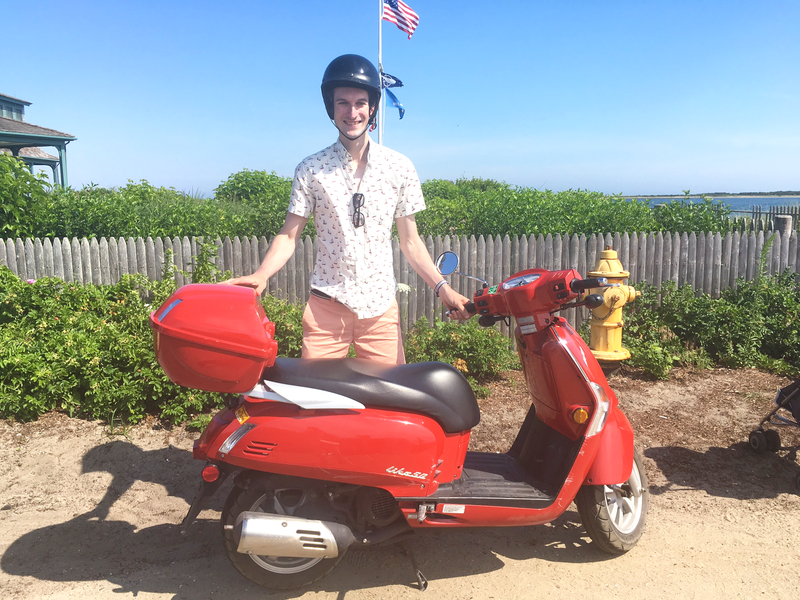 If you want more of a city scene that's still very beachy, and be able to walk anywhere and everywhere, stay in Ptown or Hyannis. 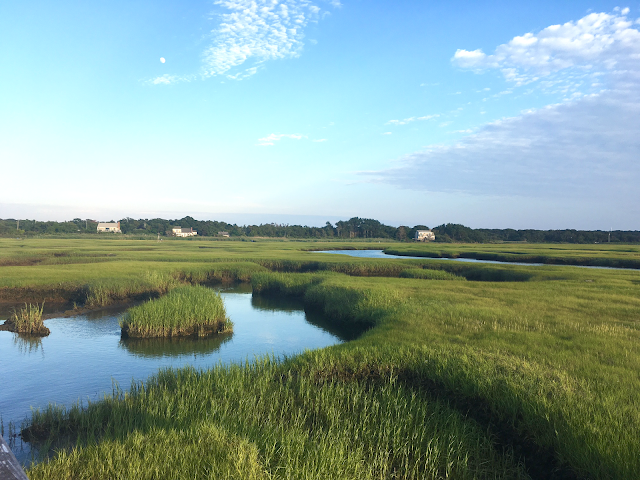 If you're looking for total tranquility and an escape, stay in the Truro, Wellfleet areas. 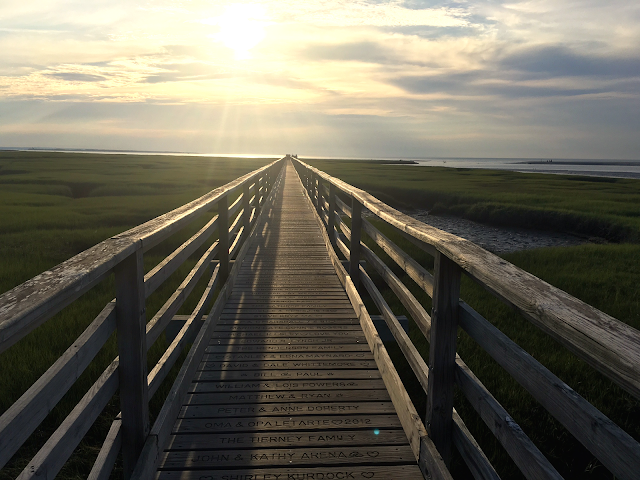 If you're looking for a good mix of things to do and beachside fun, Eastham, Orleans, Dennis, Harwich or Yarmouth. There are other areas to stay, too, so just read up and decide on your priorities. Also, I don't believe there's a bad spot on the Cape to stay. Wherever you land, you'll have an amazing. time. One thing that's been on my bucket list for years is a sunset charter on a sailboat. This year, Josh got me a private charter for my birthday. It was amazing. 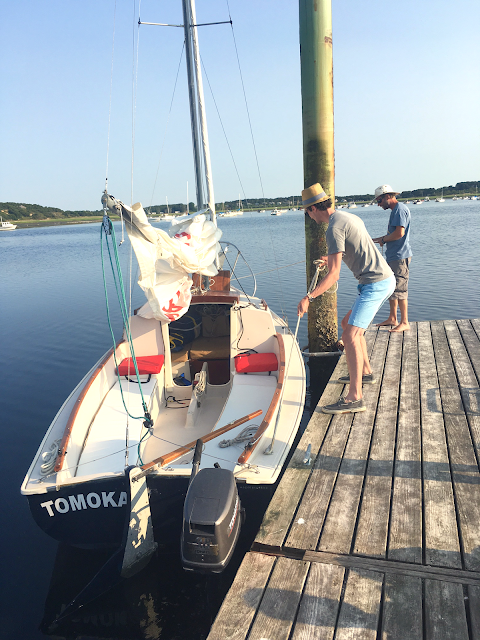 We went with Captain Curley, who docks out of Wellfleet. He has a smaller boat that really only seats about 6, so it was perfect and cozy for just Josh, myself and the captain. 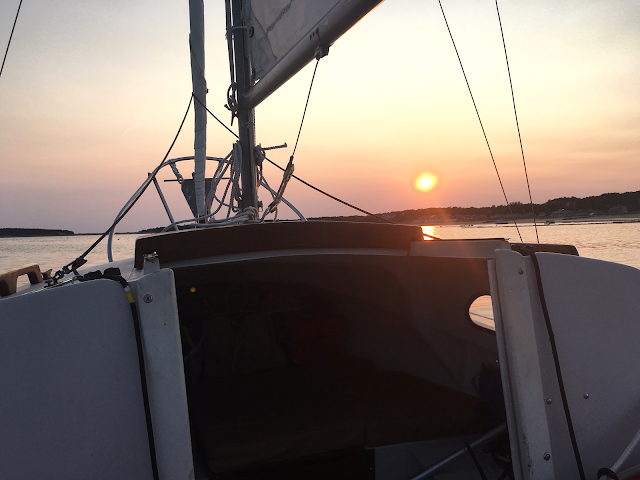 We actually chartered right as the sun was setting, and also had some time to sail as the moon rose over the water. It's something I'll never forget. We loved sailing with Captain Curley - he had so much knowledge to share with us about the Cape and sailing, and even let us steer the boat for a bit! We brought aboard some champagne, chatted with him, and enjoyed the scenery. Josh helped to get the boat out during low tide. 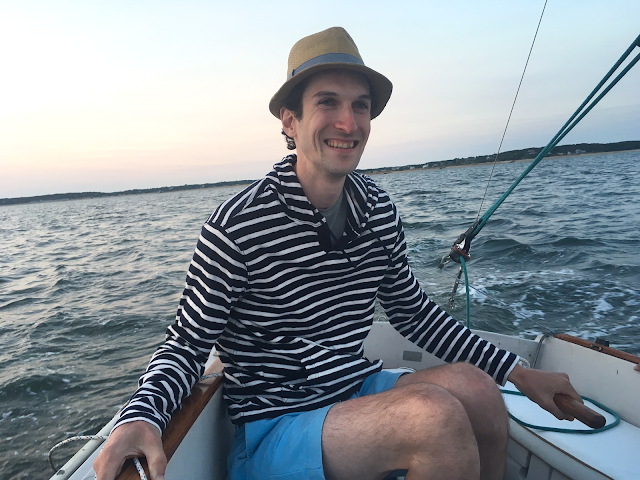 Josh got to steer the boat! Stay tuned for my Nantucket recap!